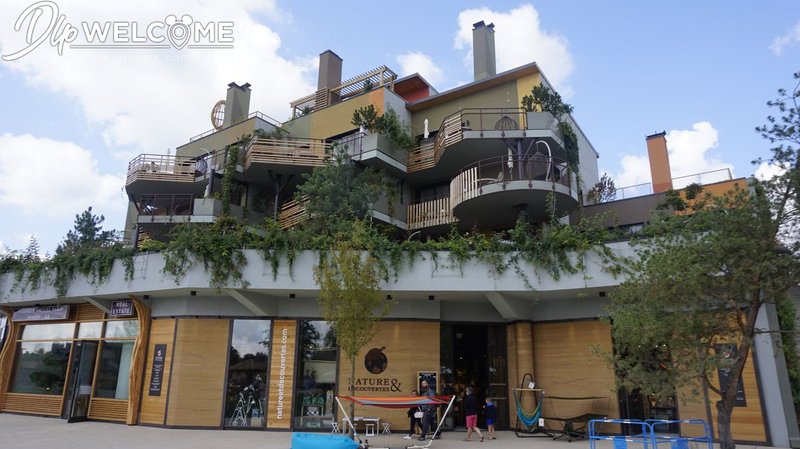 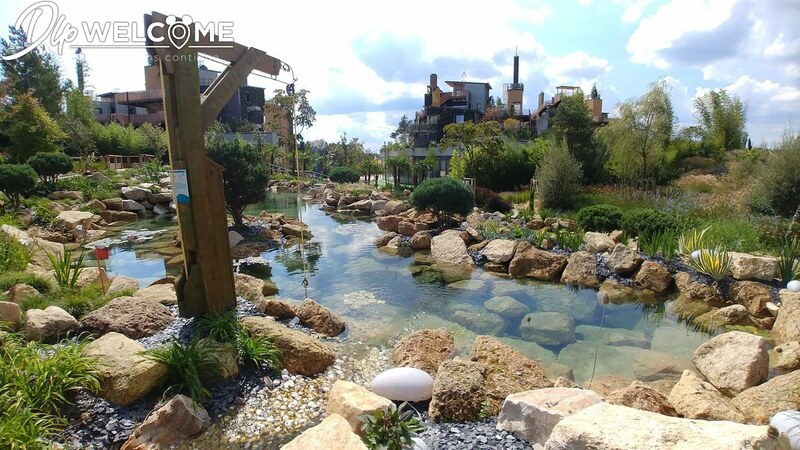 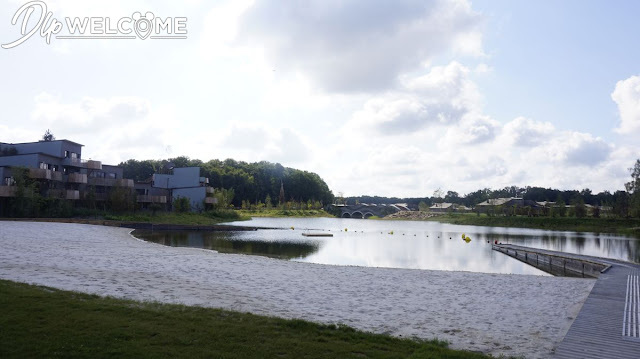 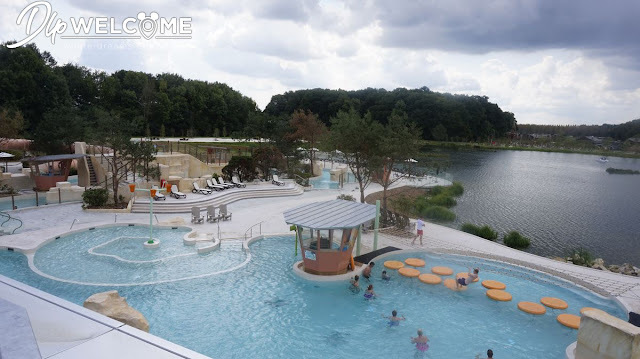 Disneyland Paris Update: Villages Nature With Awaited Aqualagon Waterpark Opens! 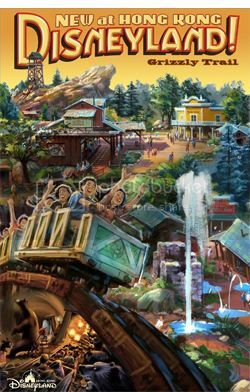 Full Pictorial and 4K Videos Report ! 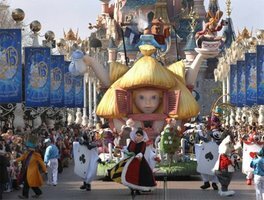 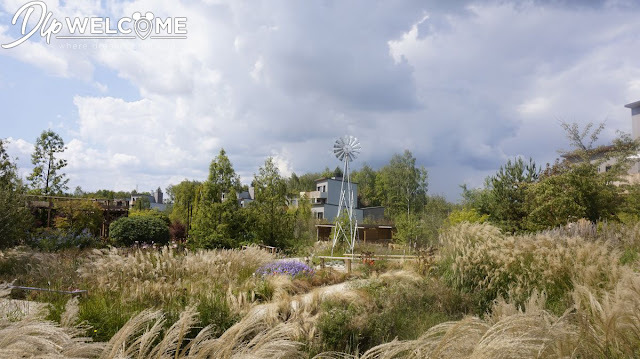 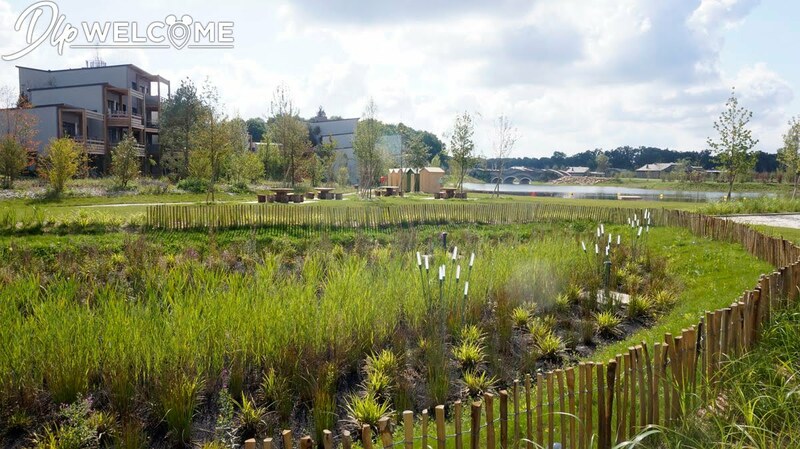 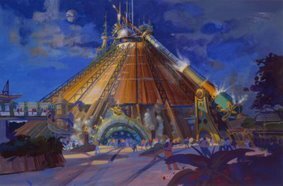 Hello everyone, thanks to Max, D&M contributor and DLPWelcome webmaster i have for you today a looong article with which you'll have a full tour in pictures and 4K videos of the all new ecological and tourism complex, Villages Nature Paris at the gates of Disneyland Paris - just 4 miles from the Parks! 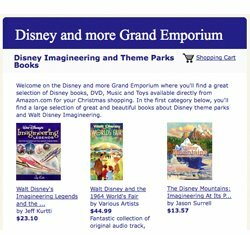 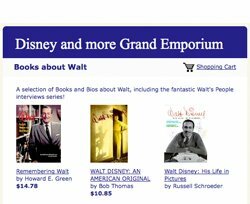 This project, which was born 14 years ago on May 19, 2003, changed with the years to become the current site. 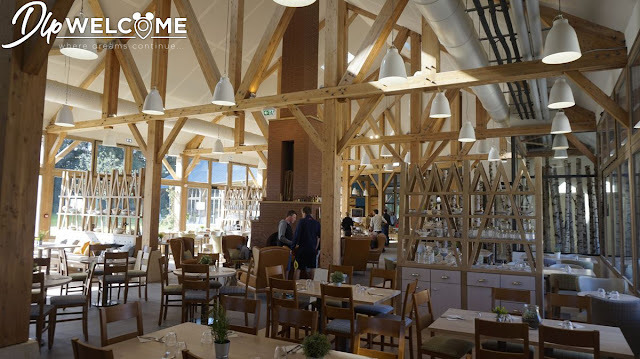 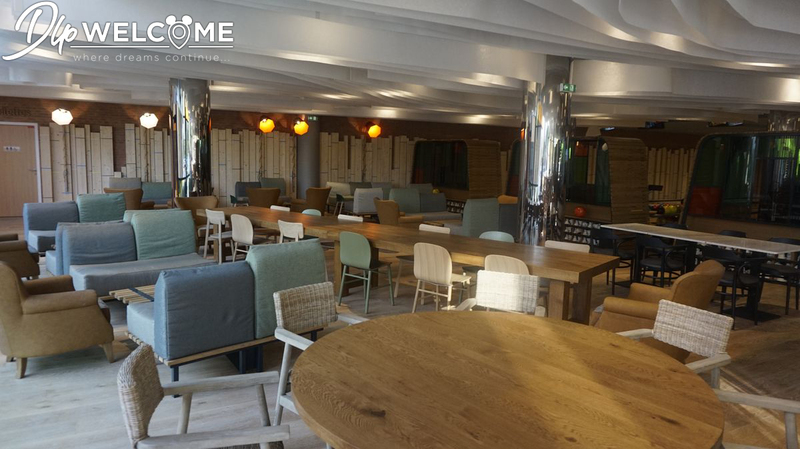 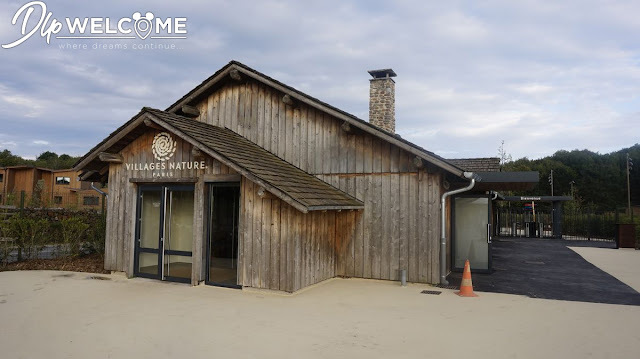 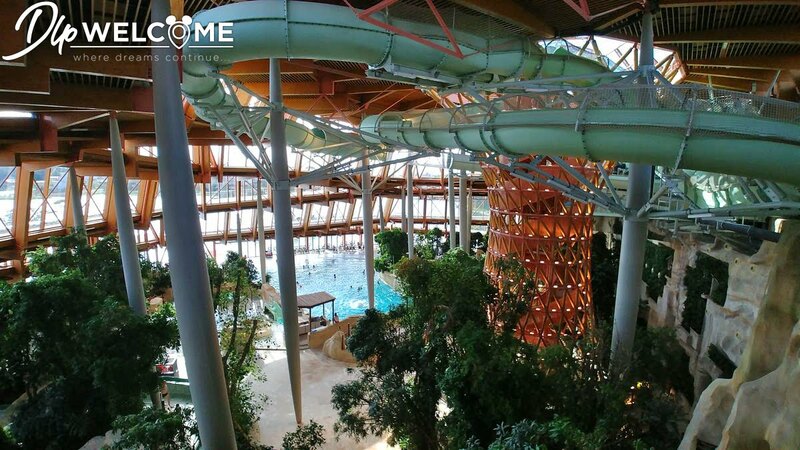 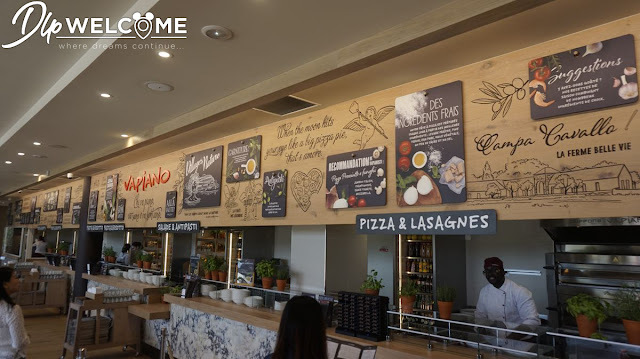 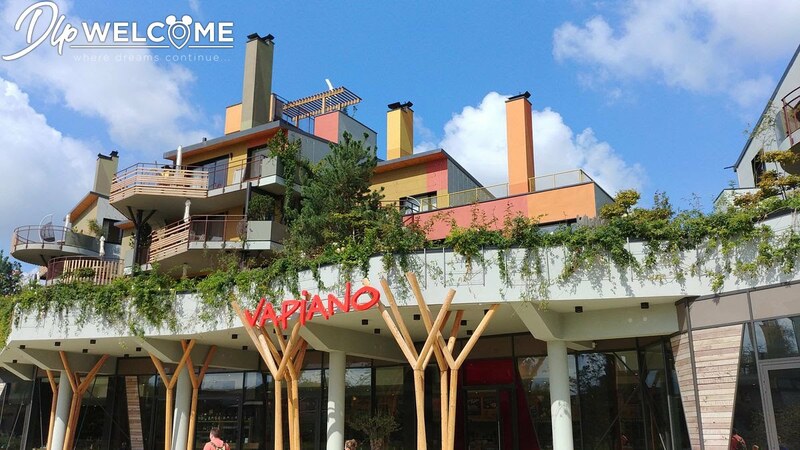 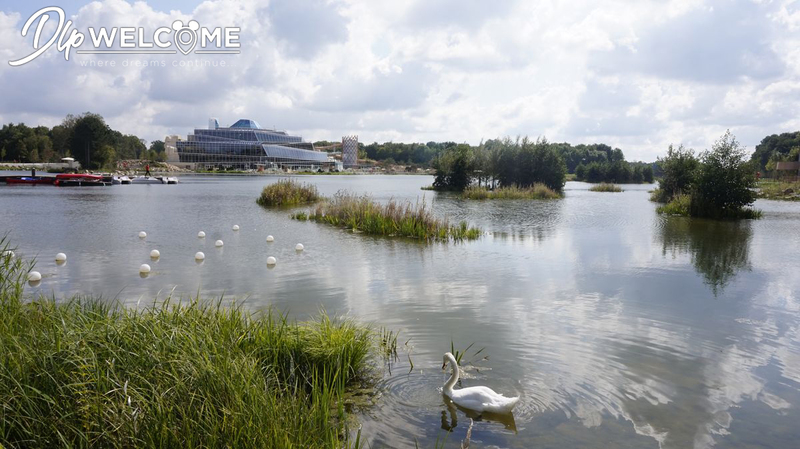 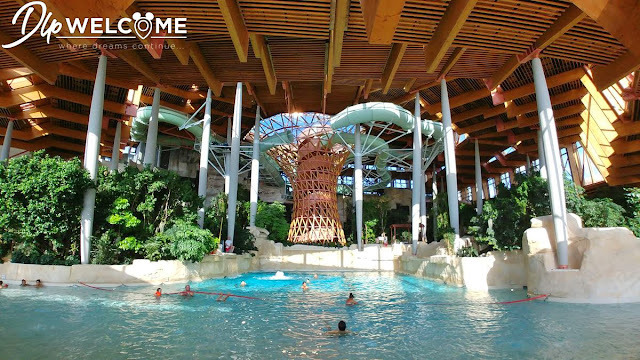 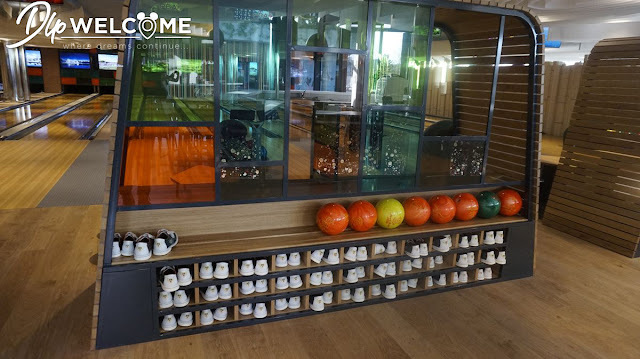 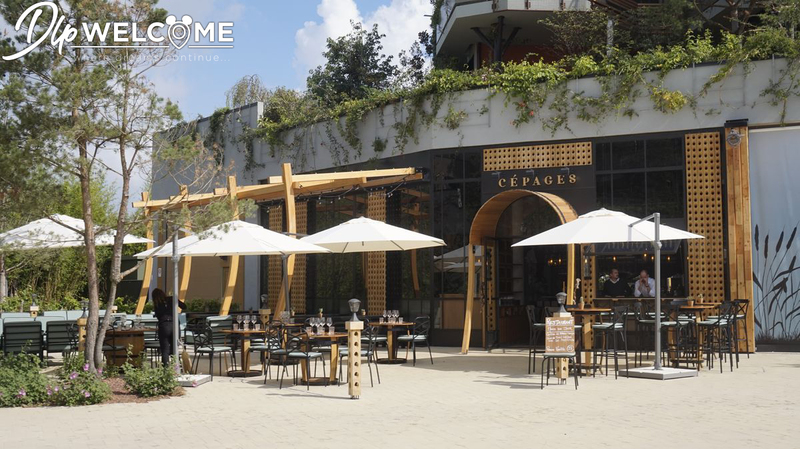 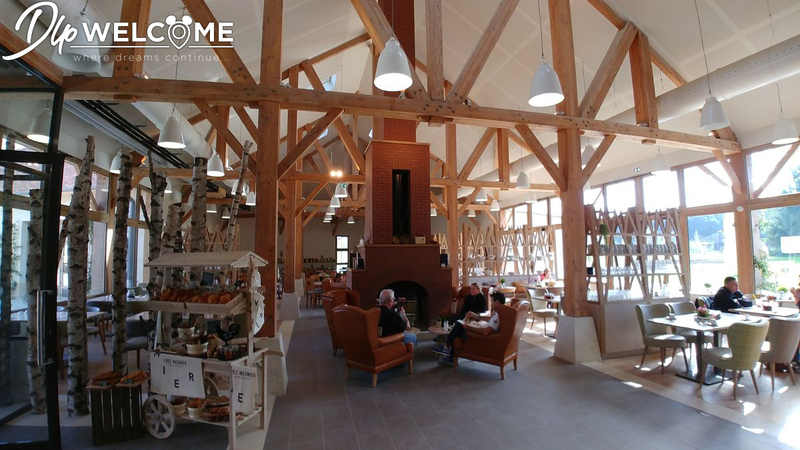 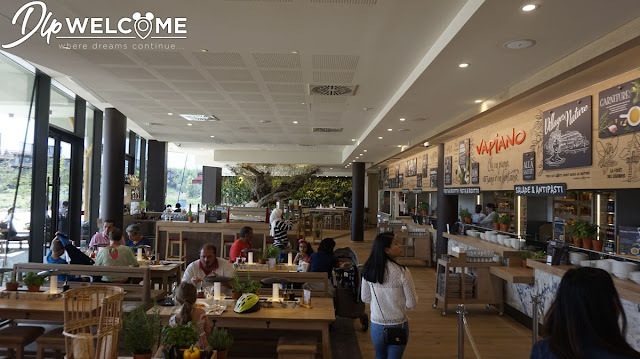 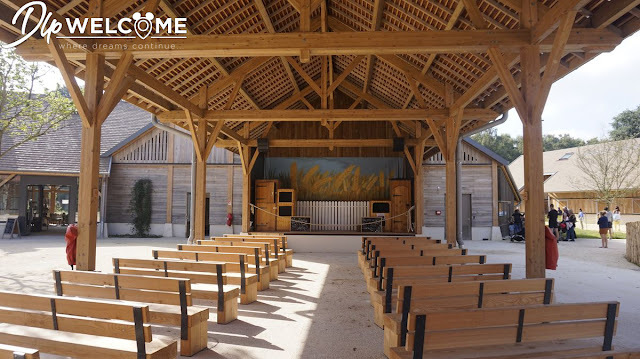 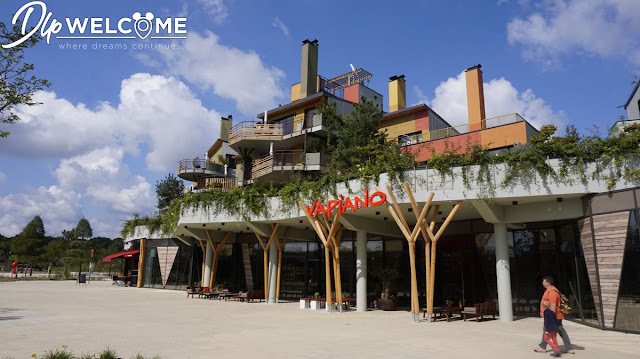 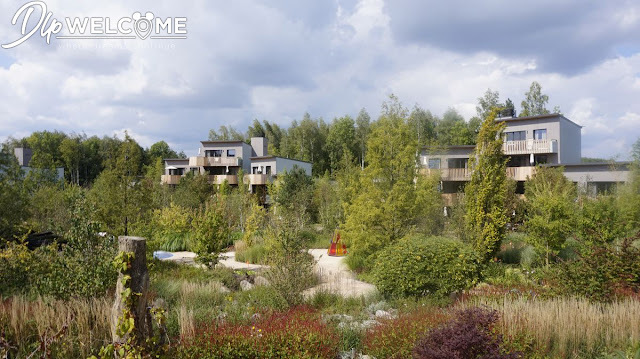 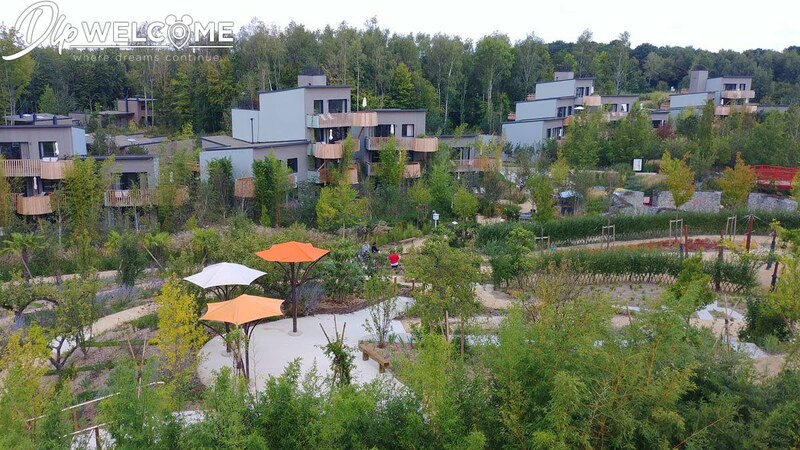 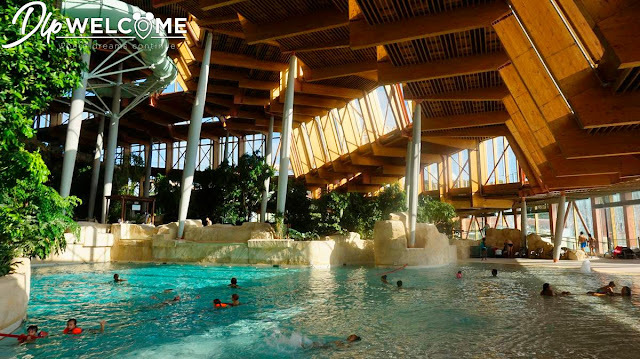 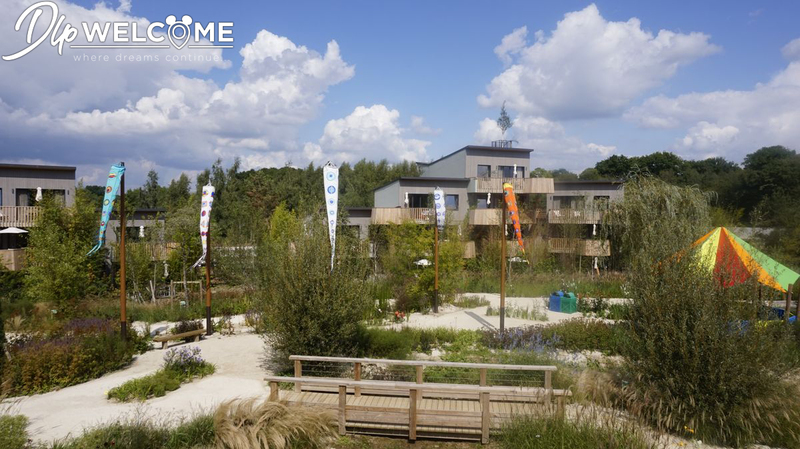 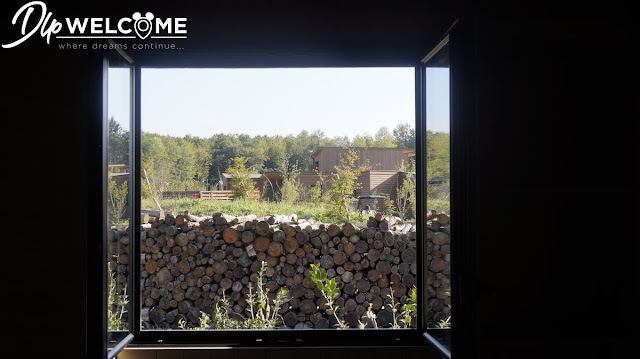 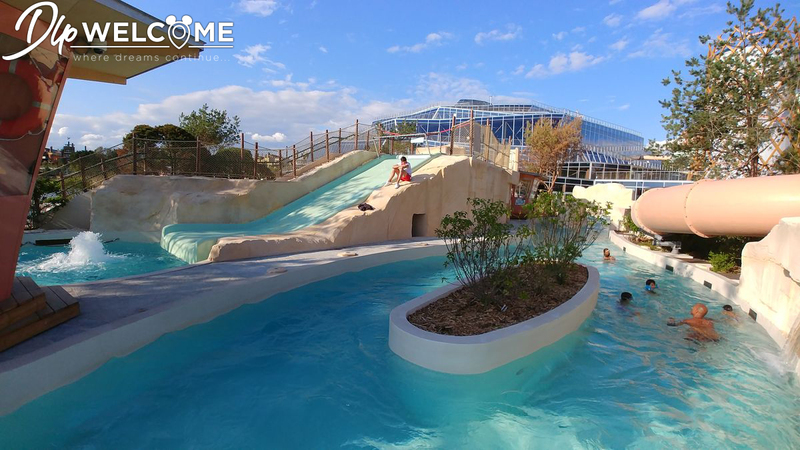 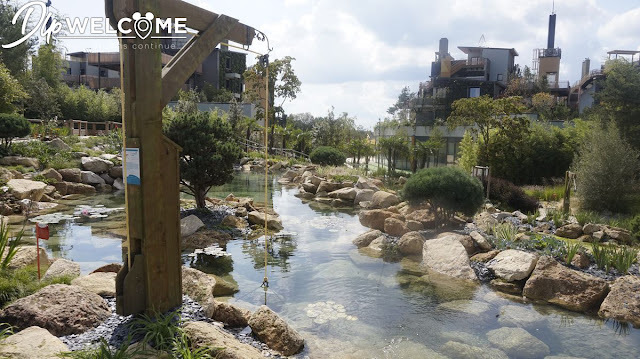 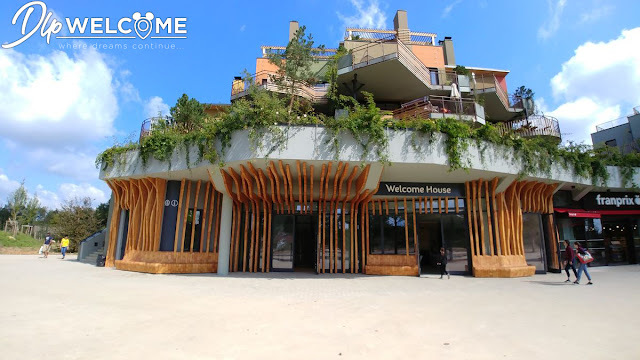 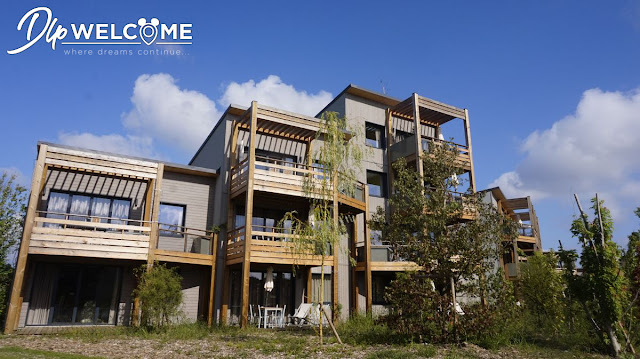 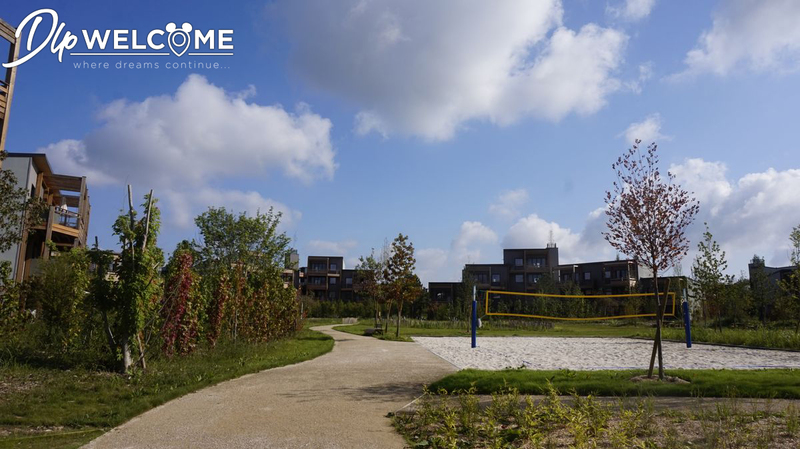 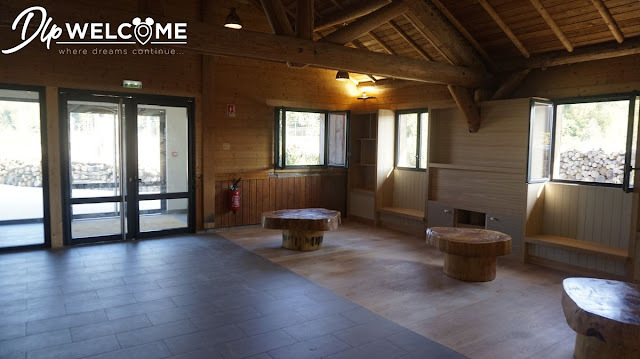 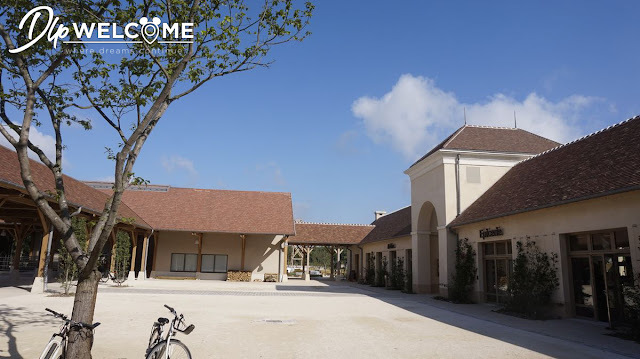 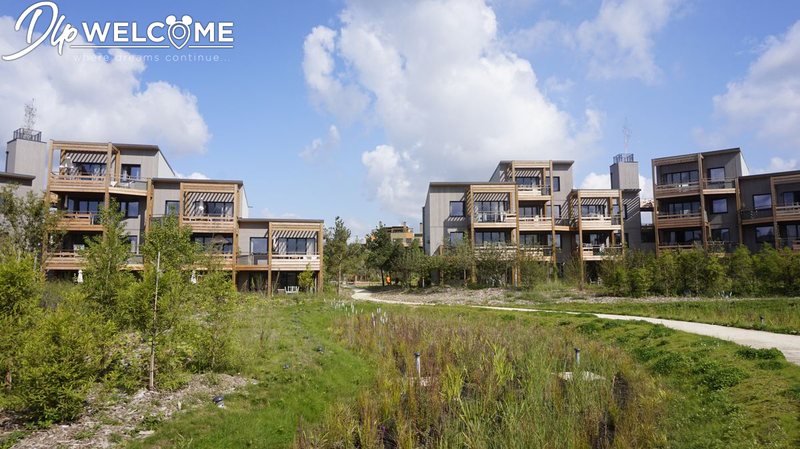 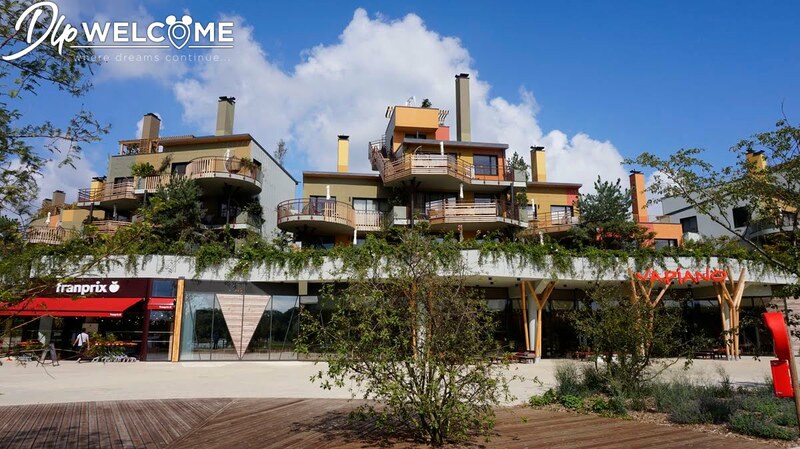 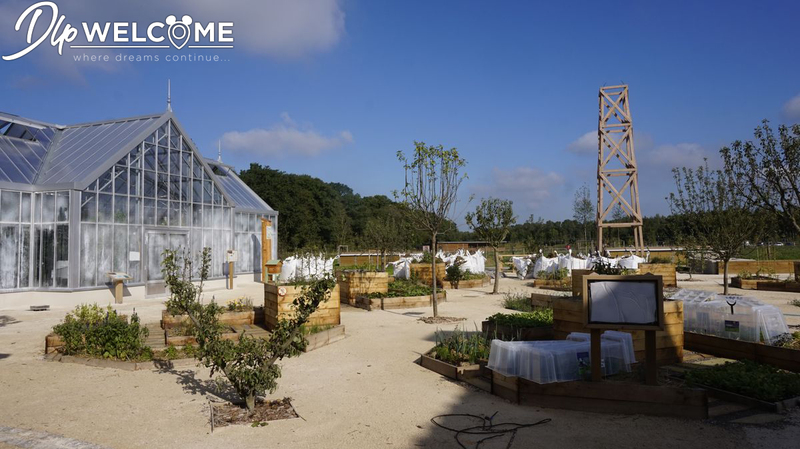 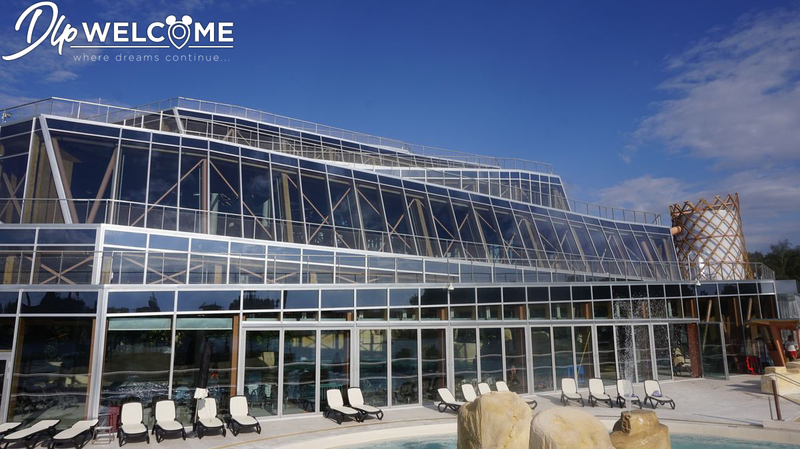 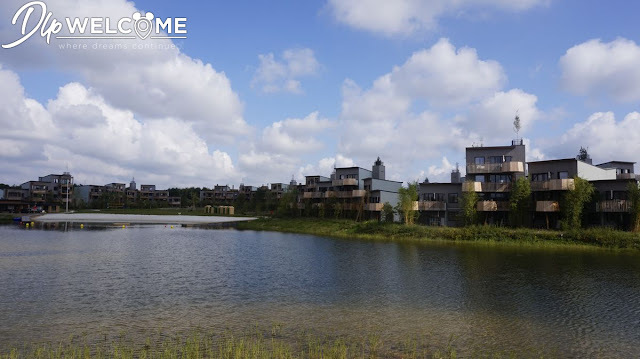 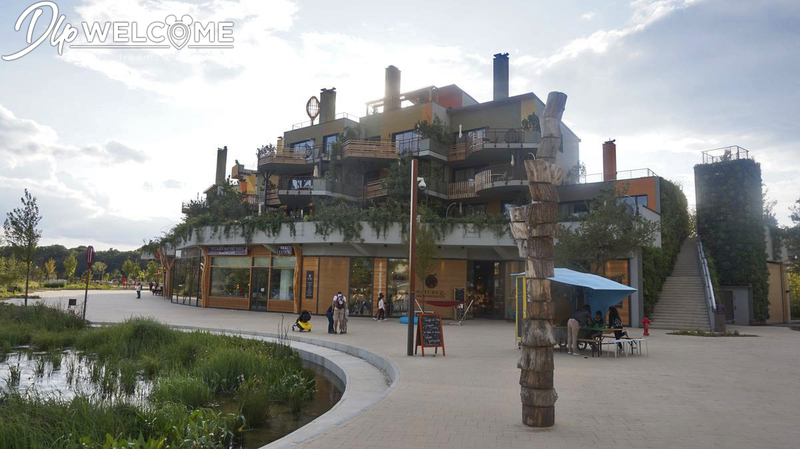 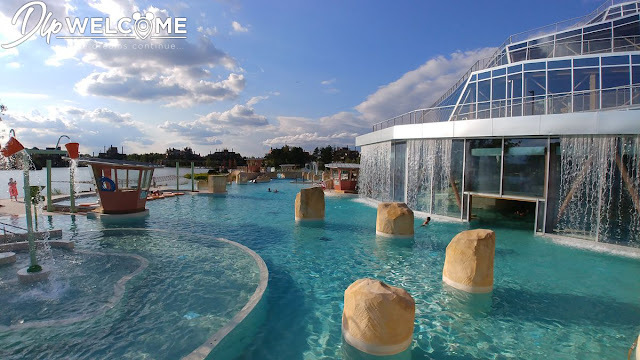 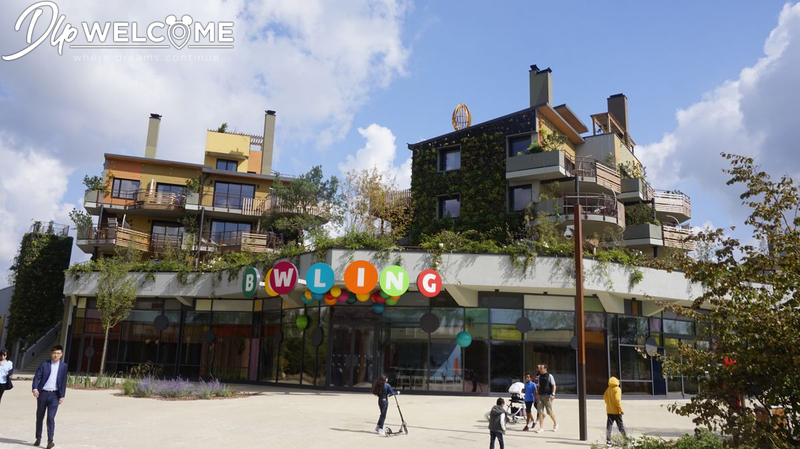 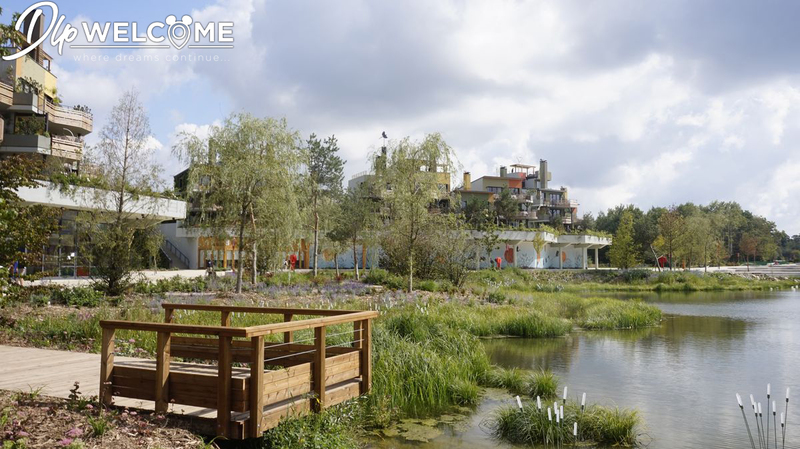 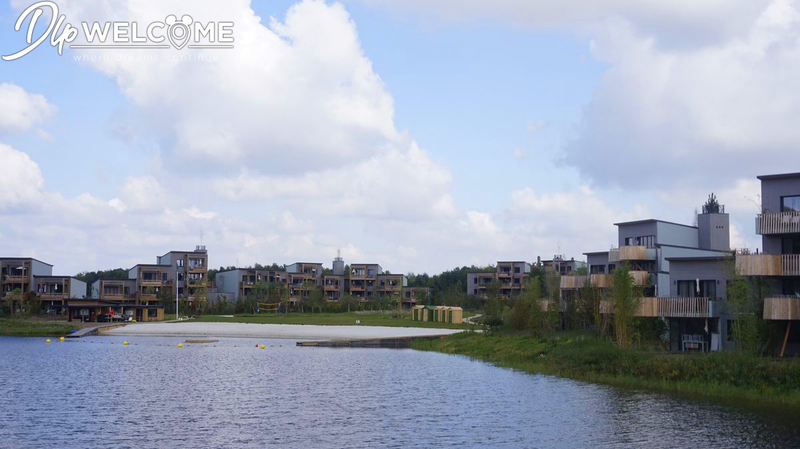 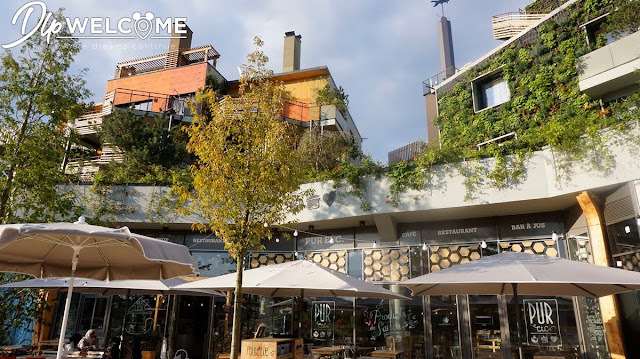 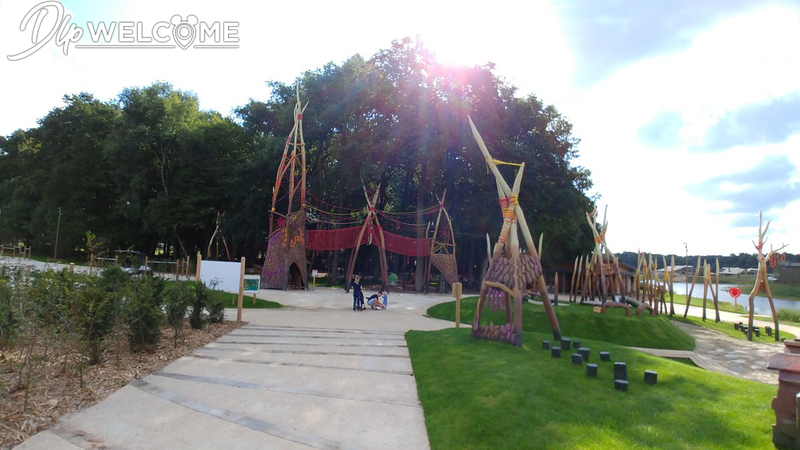 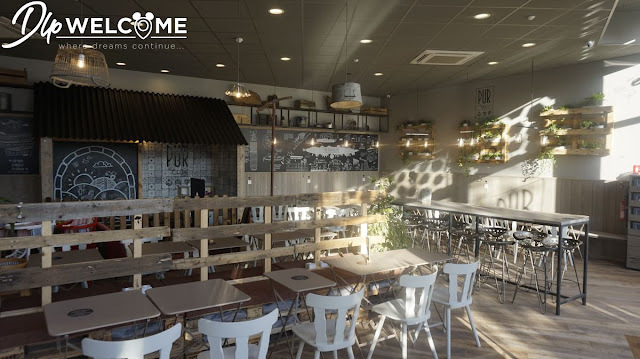 Villages Nature is a joint venture company between the Pierre & Vacances Group and EuroDisney S.C.A, with the experience of « Center parcs » - a french tourism complex with waterparks - and the love of detail that Disney put on its own projets . This is by no means a third park on the Disneyland Paris site. 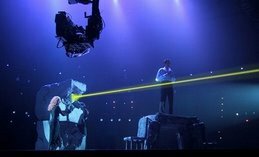 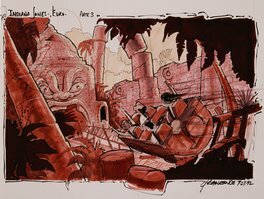 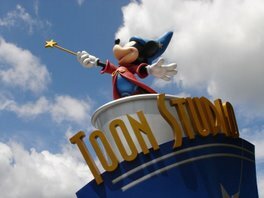 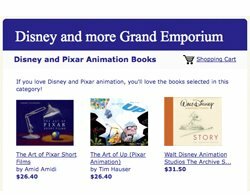 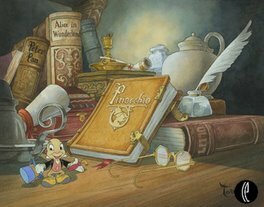 The activities will be unique for some and no reference to Mickey is present since the company is independent. 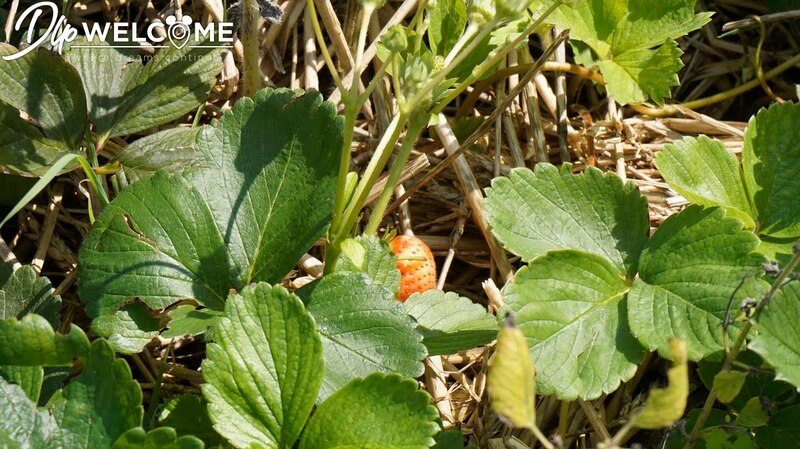 Its peculiarity? 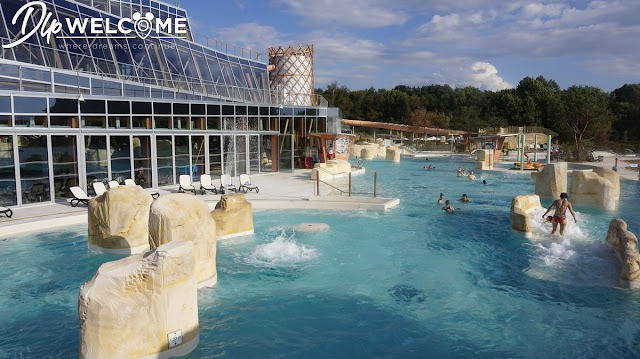 The geothermal that takes the hot water at 1.3 miles underground at 172.4°F. 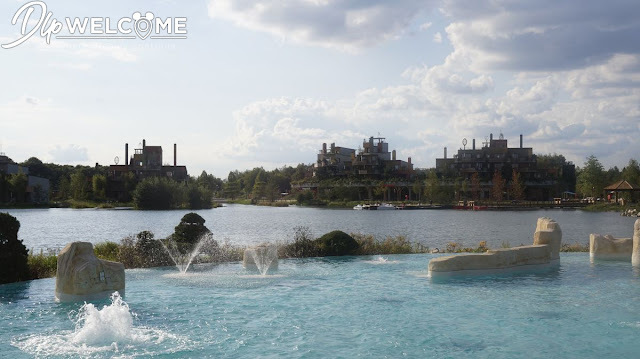 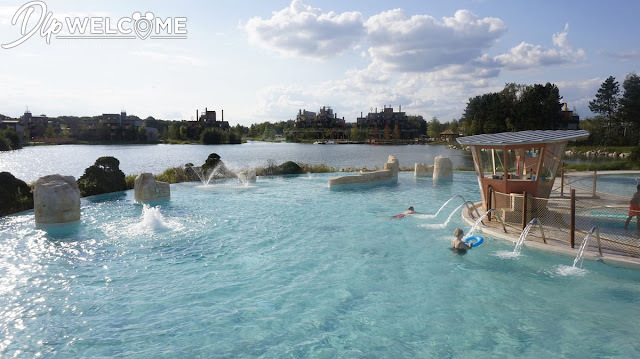 Thanks to a network of 11.1 miles of canals, the waters are heated and distributed throughout the site as well as the one of Disneyland Paris for all equipments and places of life. This save nearly 9 000 tonnes of CO ² per year. 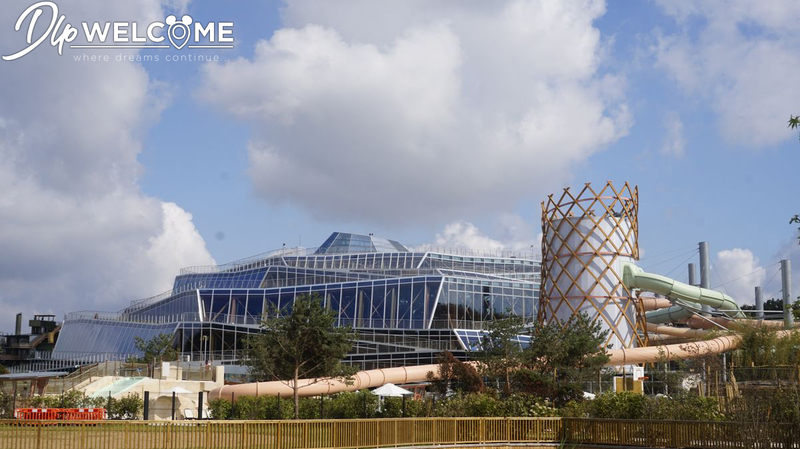 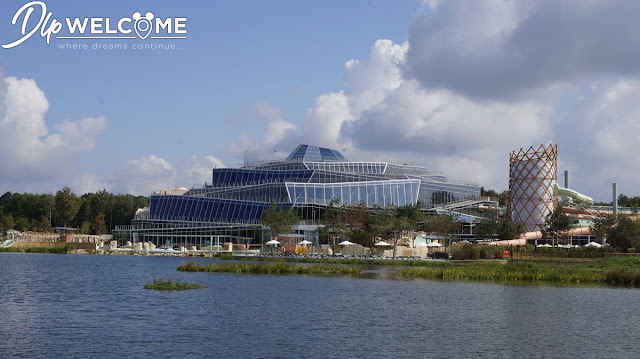 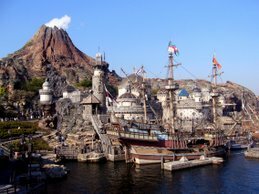 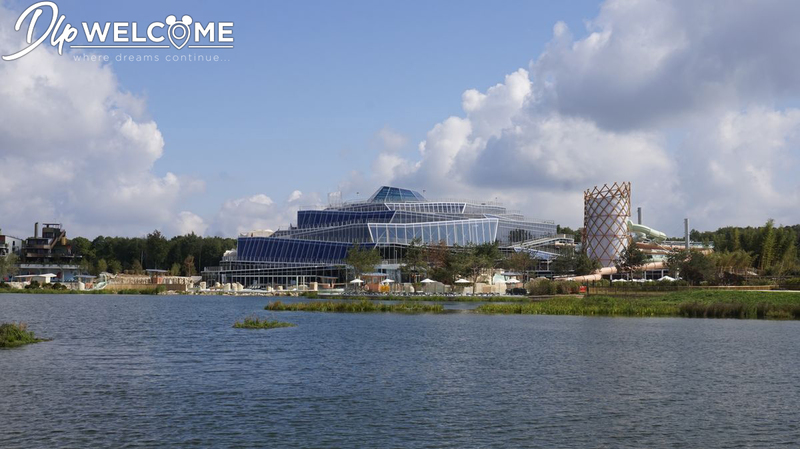 The use of geothermal energy allows to provide all the heat needed by Villages Nature but also up to 50% of the heat needed by the two Disney theme parks and the Disneyland Hotel, located further north. 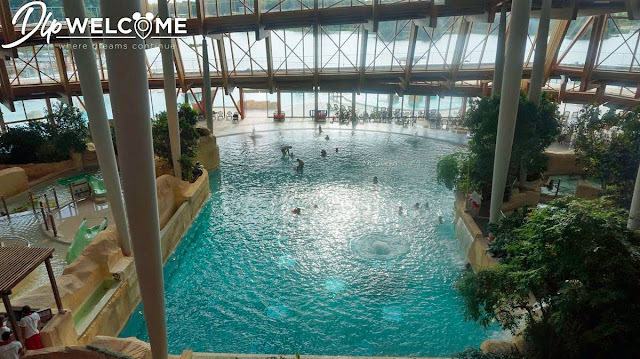 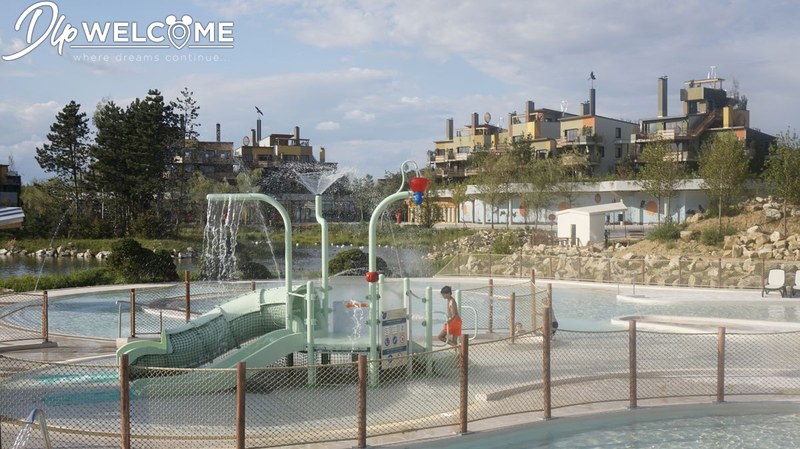 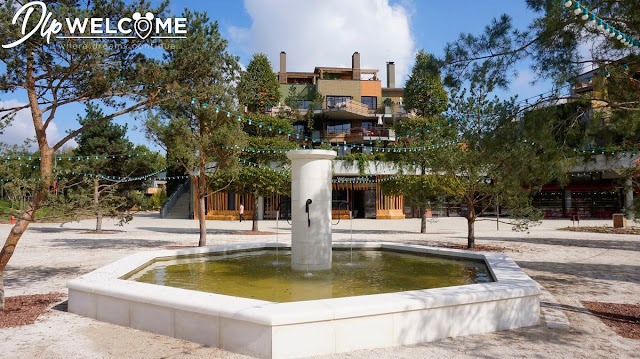 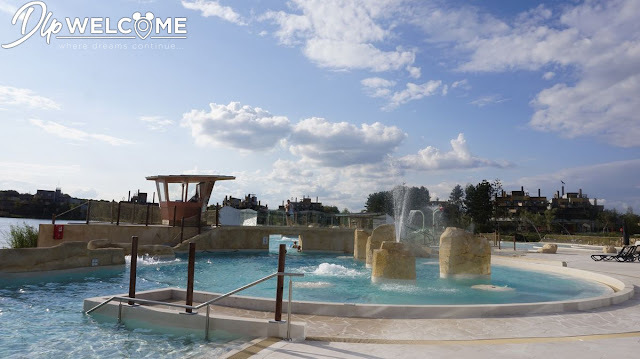 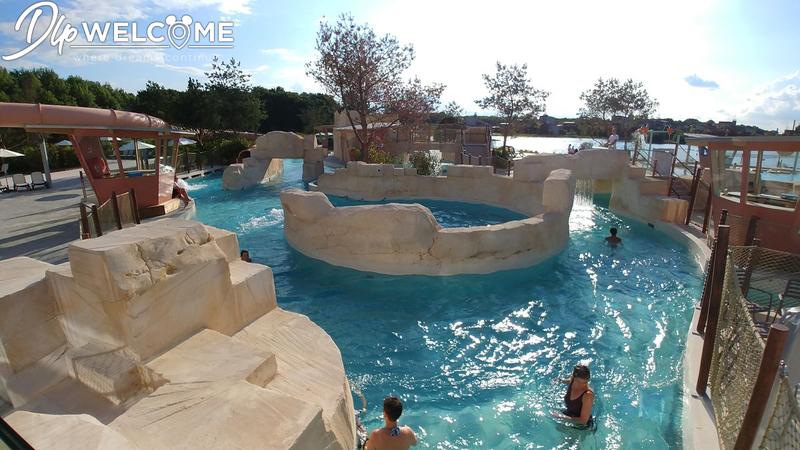 At Villages Nature, the bathing area of the Aqualagon is offering water at 30 ° C all year round. 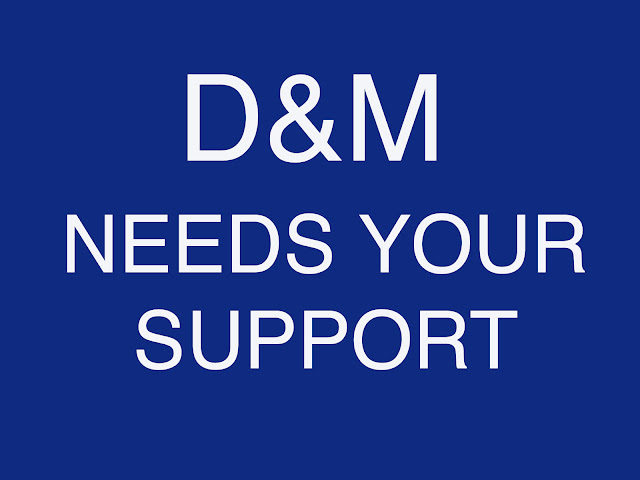 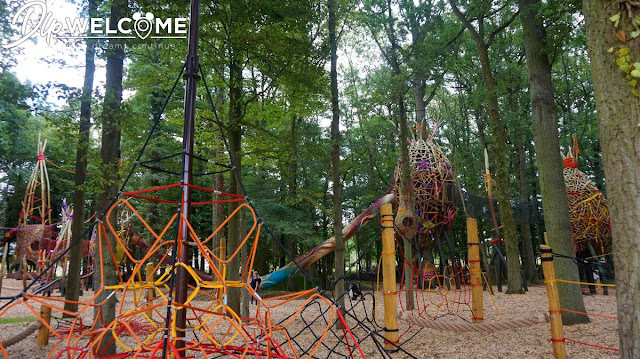 The goal is to propose playful and sport activities in link with nature, and having the least impact on it. 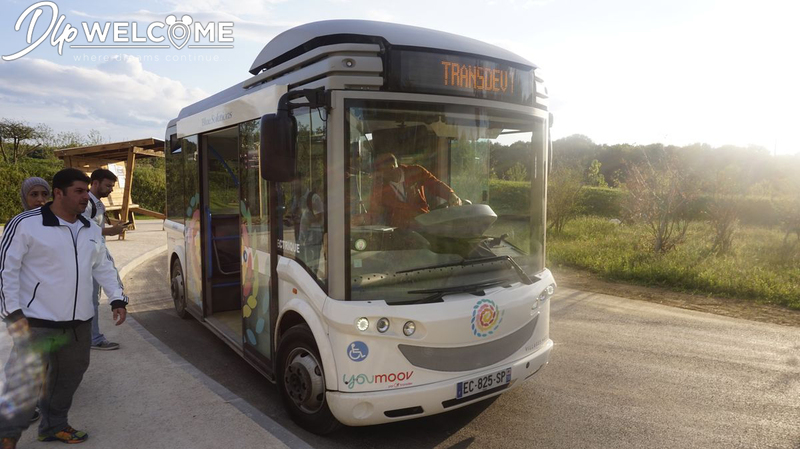 For exampleVillages Nature propose electric transport, bicycles and choices of organic products for all the family. 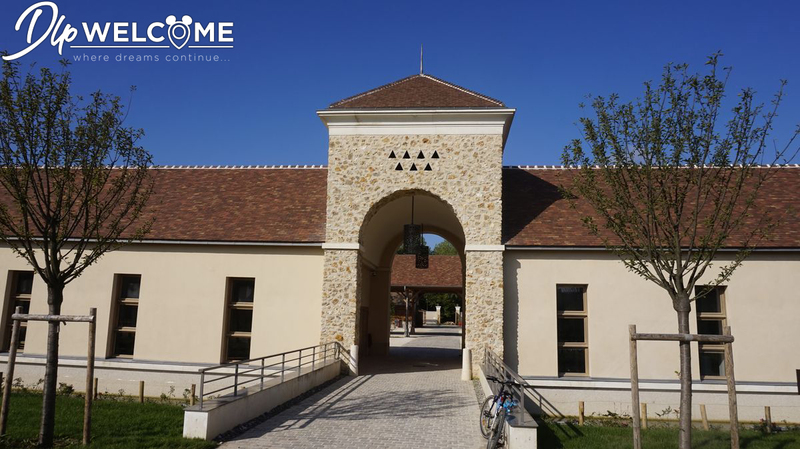 But let’s start by the beginning, and we are Saturday 3, September 2017, the second opening day at 9.30 am. 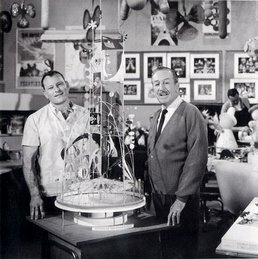 Here we are in front of the entrance. 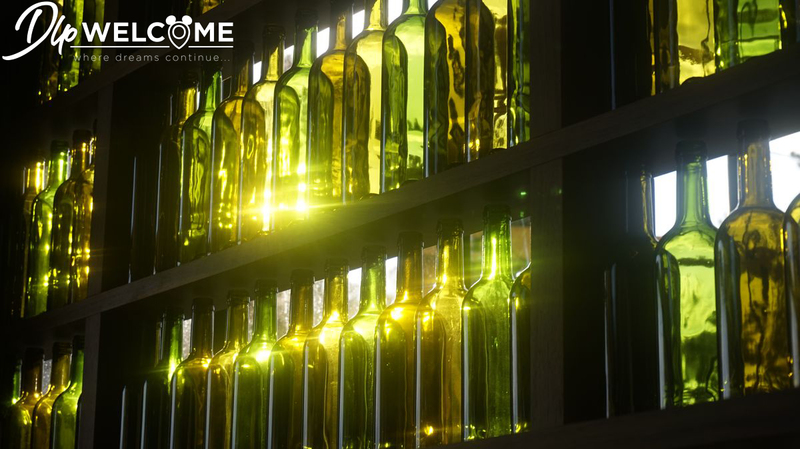 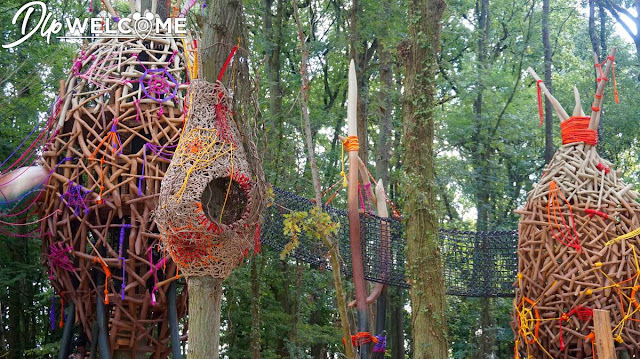 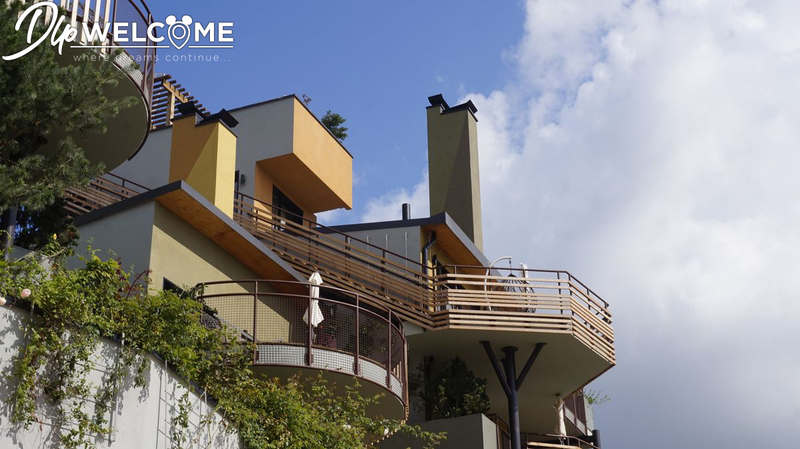 Here ,visitors wishing to make a day of "Accrobranche" or visit Villages Nature meet at this welcome house. 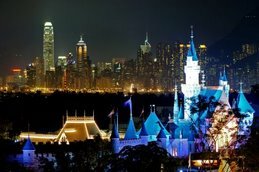 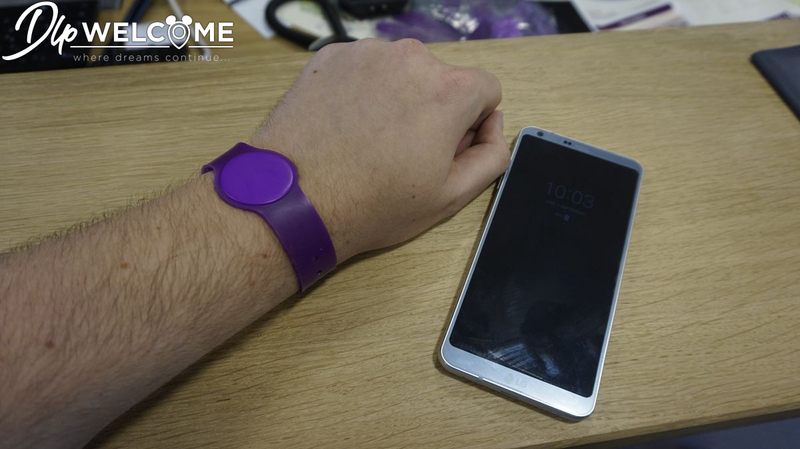 A bracelet working like Walt Disney World’s Magic Band is provided to the guests. 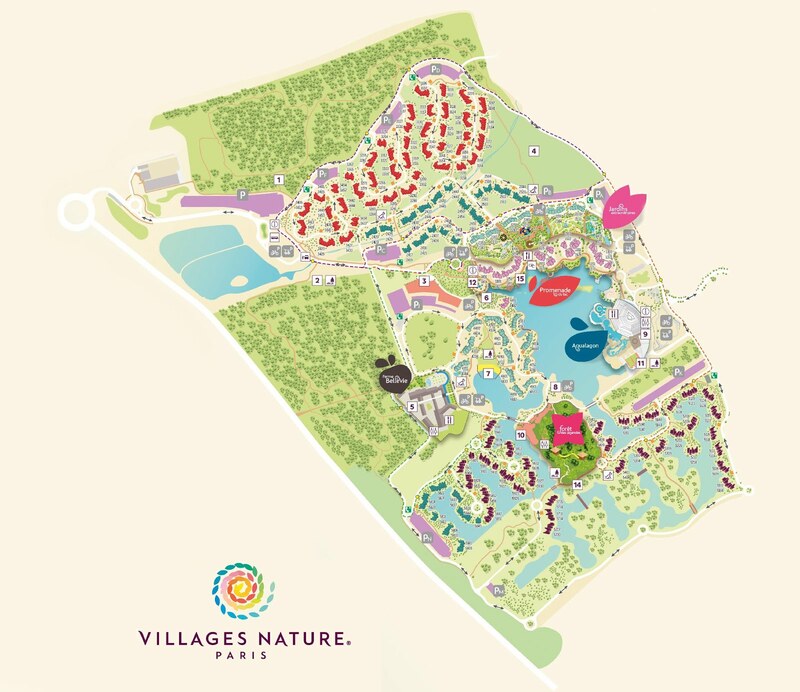 This « Village Pass » provides access to all different experiences included in the entrance fee but also to others options purchased during the day ( pony or pedal boat rides, cooking classes, and many more). 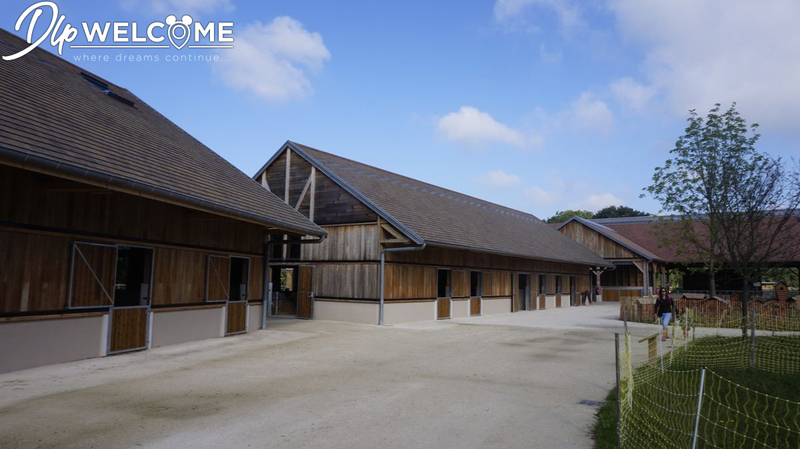 But let’s move ahead, direction the Ferme BelleVie - "Beautiful life’s farm". 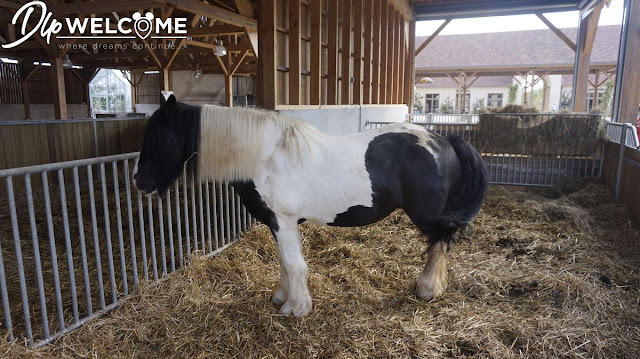 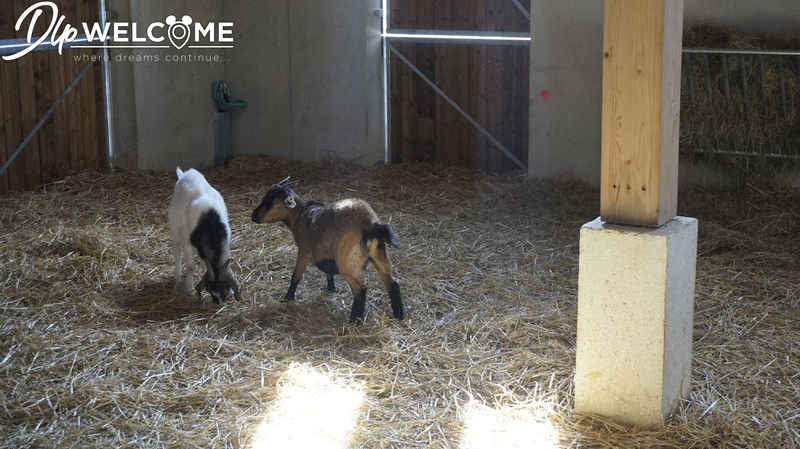 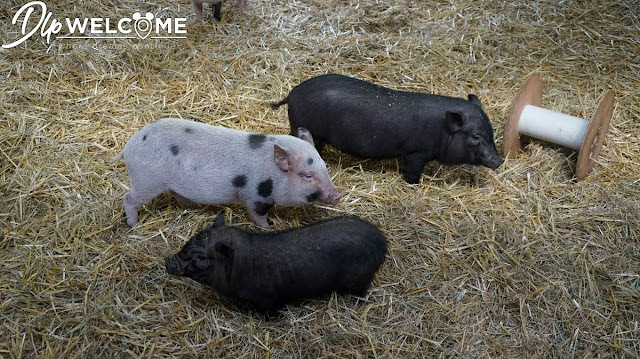 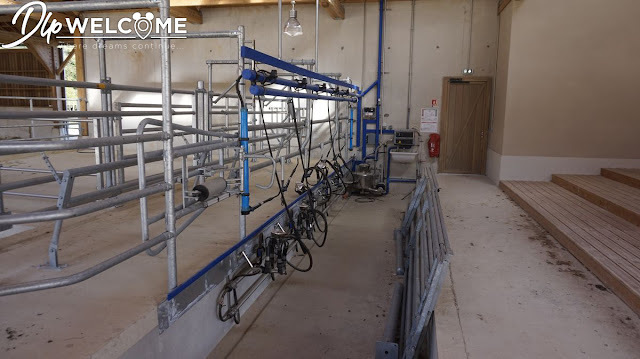 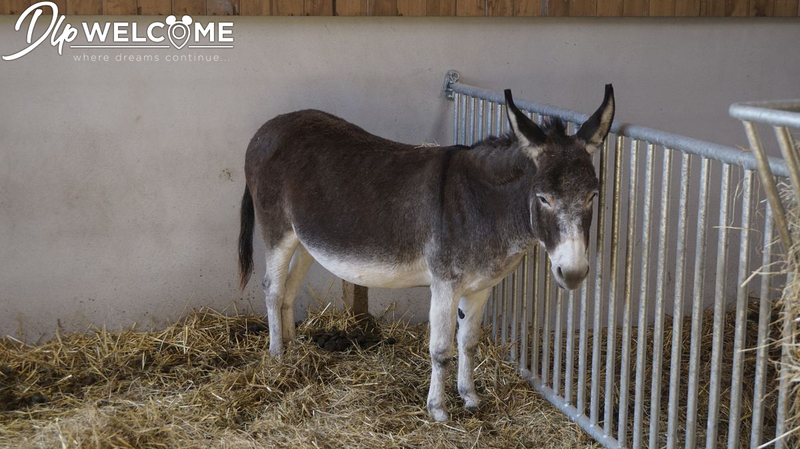 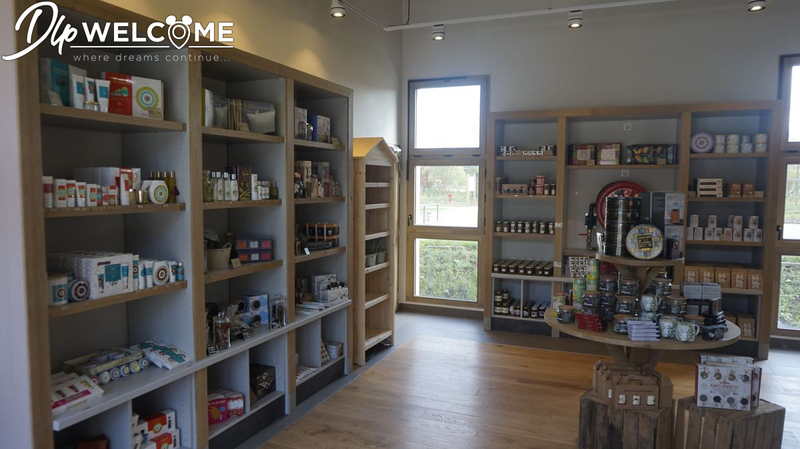 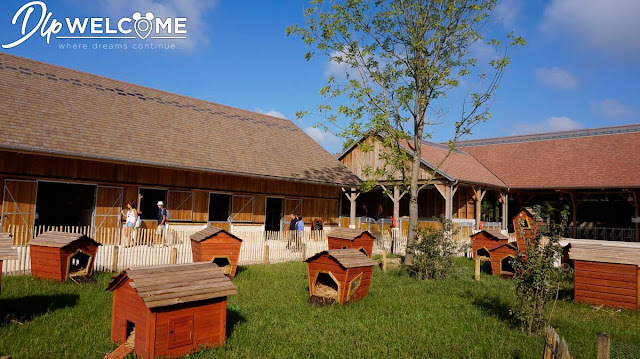 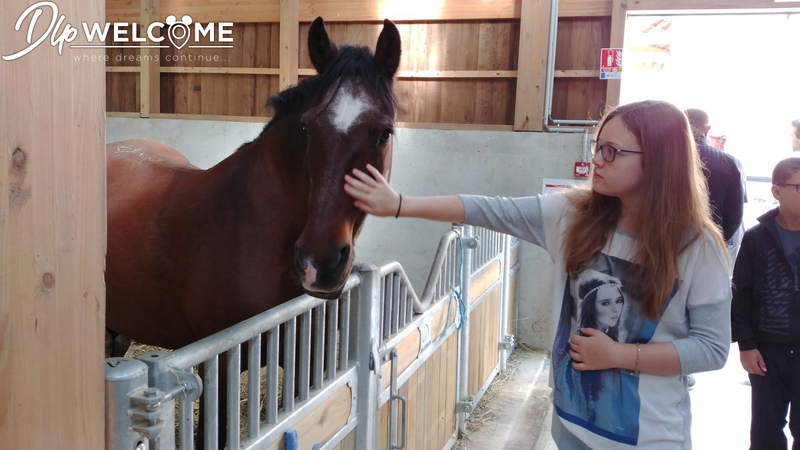 At this educational farm you'll be able to meet the animals of the farm but also to discover how the animals are feed, their peculiarities and how they are healed, or, for example, how to milk a cow! 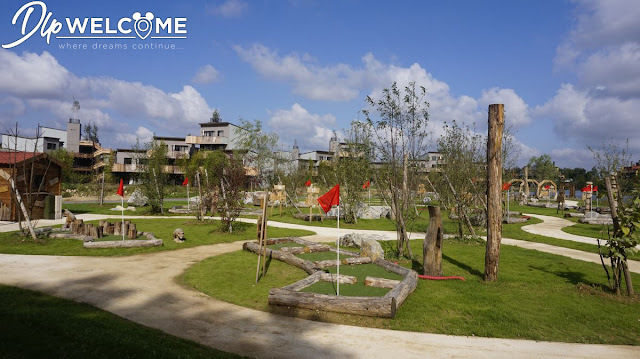 This place is the departure of many excursions and offers especially a moment of relaxation. 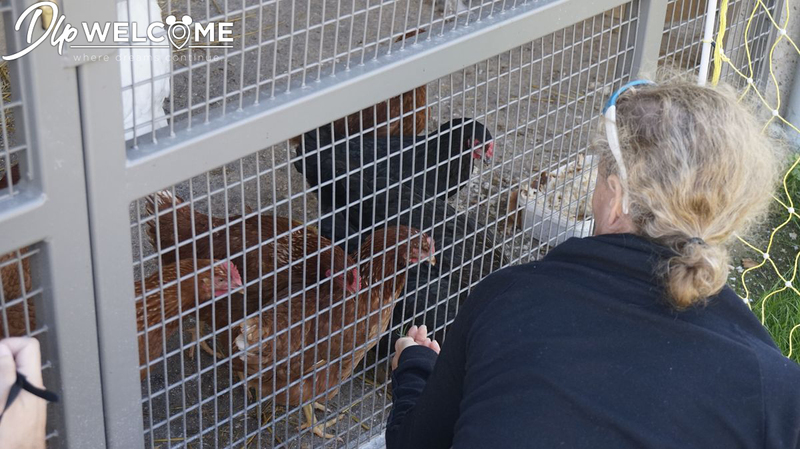 This contact with animals is ideal to start the day. 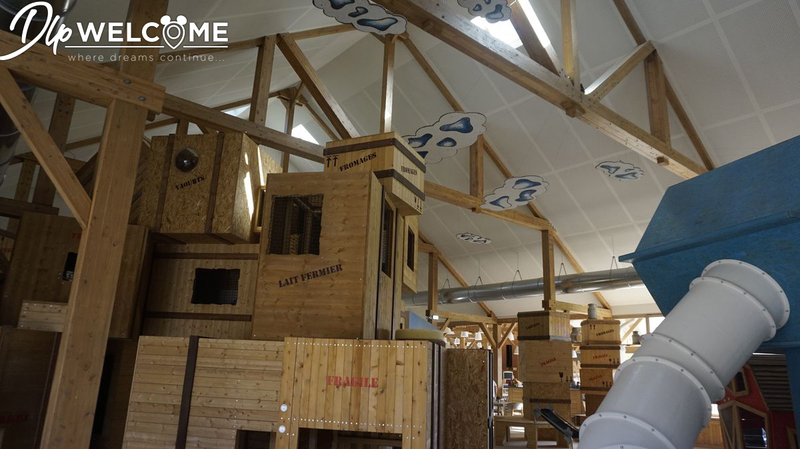 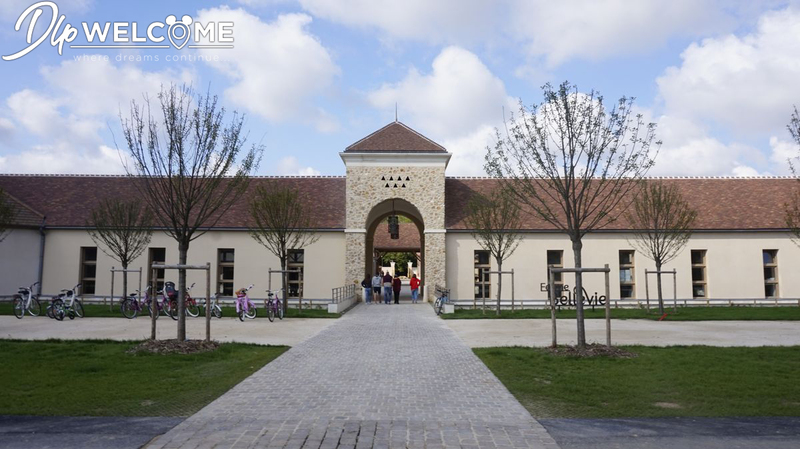 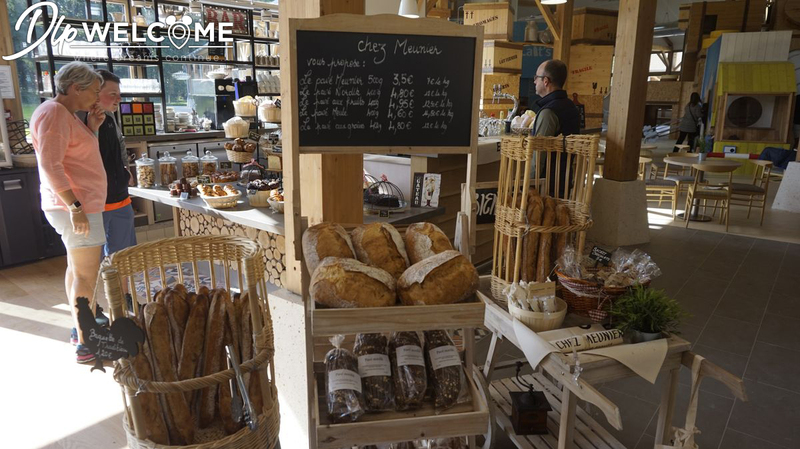 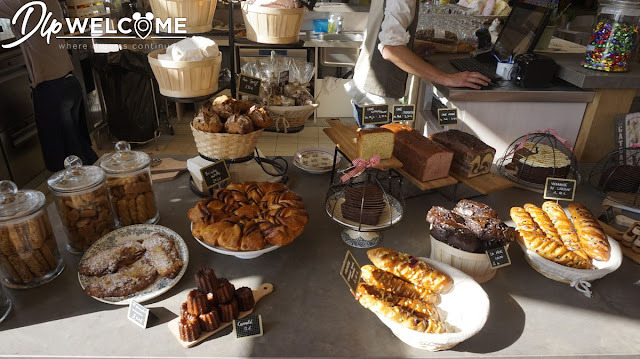 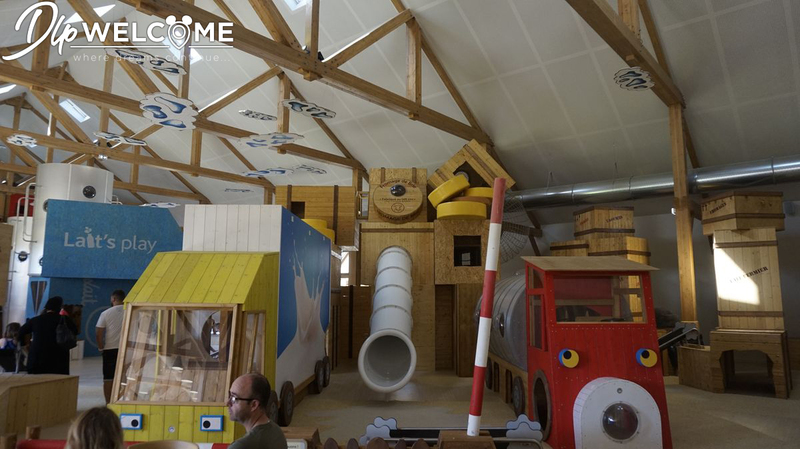 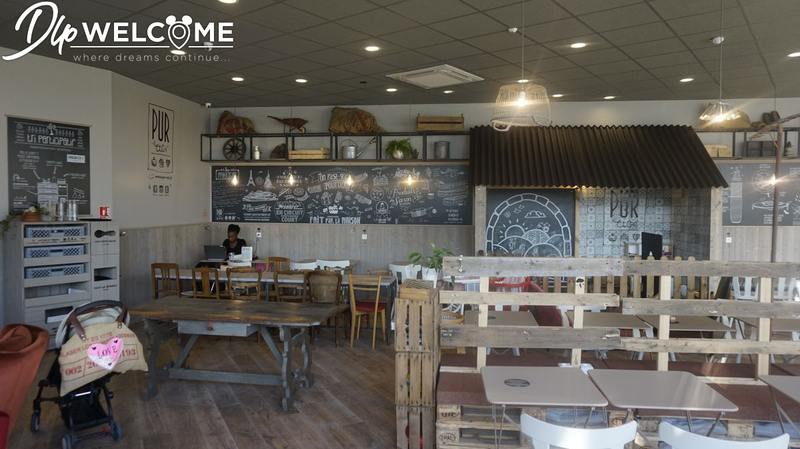 The farm also include a grocery store, a bakery and an indoor playground for children "Lait’s Play" ( understand « let’s play » , in french « lait » means « milk » but the spelling of « let » and « lait » is the same). 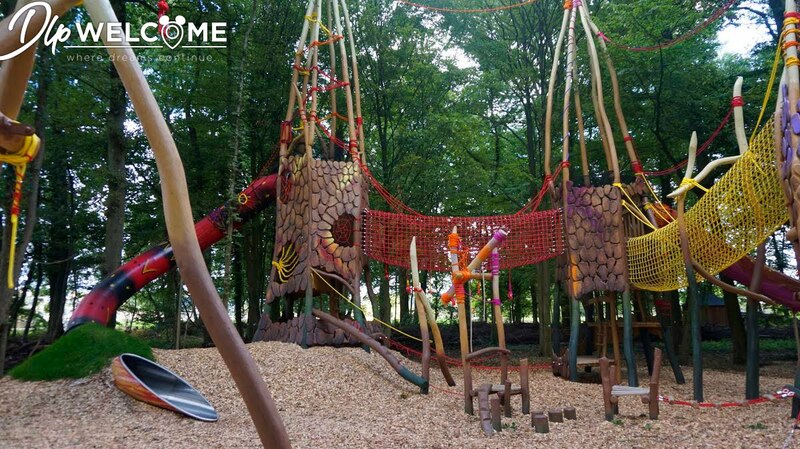 No doubt, even adults would like to play on this giant playground ! 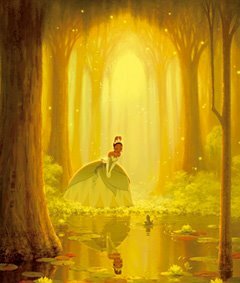 On the way out, let's move to "The Forest of Legends"! 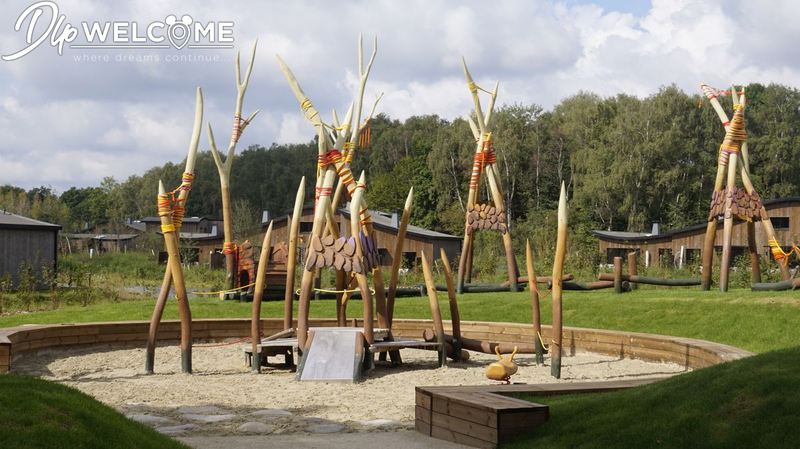 This outdoor playground gives to the youngest the opportunity to play in open air in the forest. 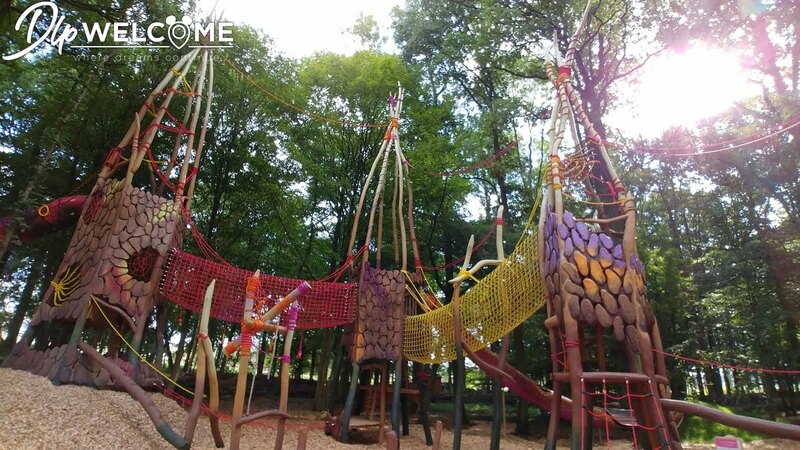 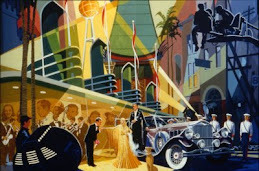 It's in a colorful style where the imagination can be free that children will be able to play. Just behind this space, a camp site allows you to find a show about legends, but it's also here that is proposed one of the most fun activities ( with a fee ), the construction of a hut! 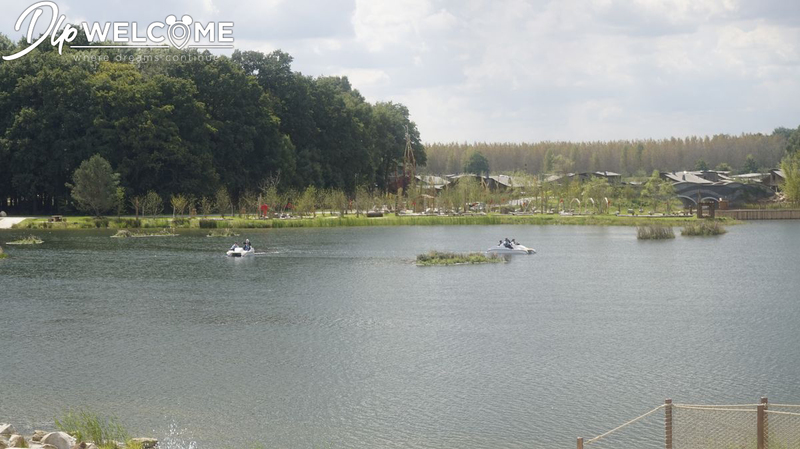 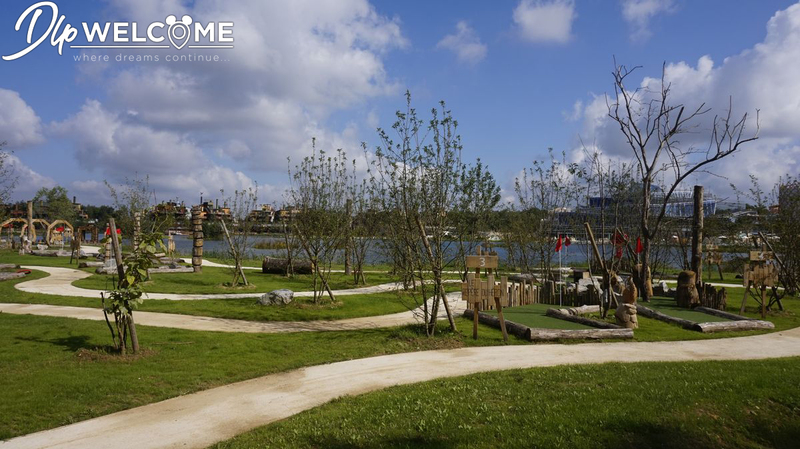 At the exit of the forest, guests will find a mini-golf with a view of the lake and the Aqualagon. 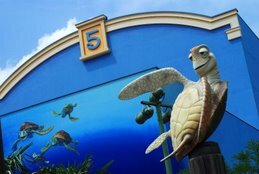 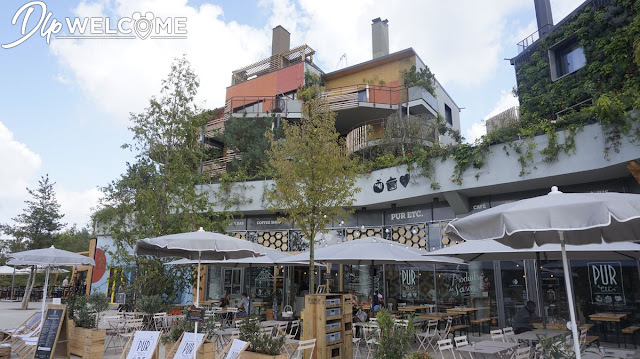 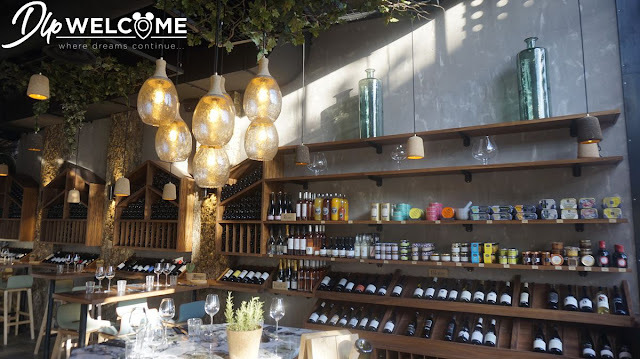 Let's discover the Beach neighborhood! 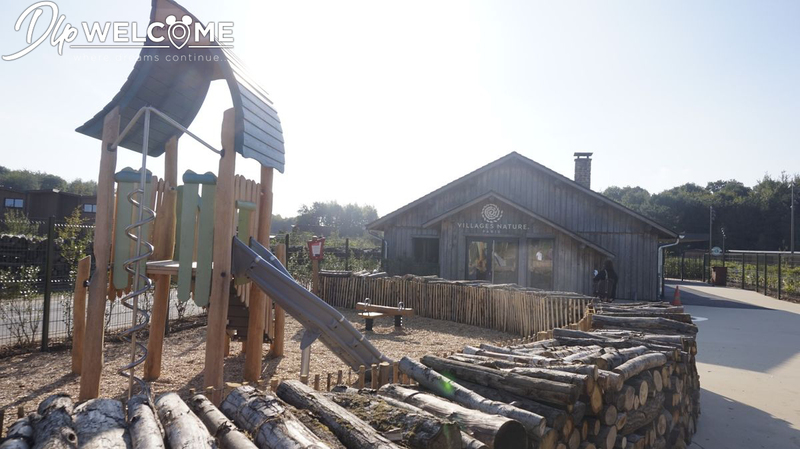 After having conquered the hearts of the children, it is time to take care of adults! 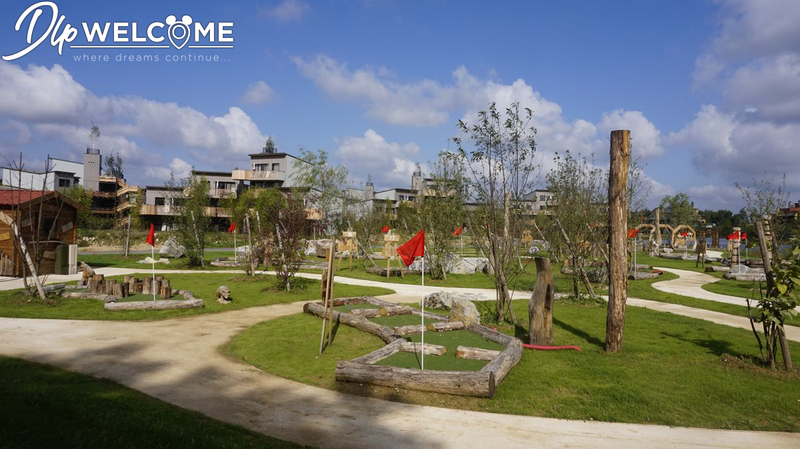 For this, the site offers a garden, one which is so huge that its name is the "Extraordinary gardens". As you'll have understood, there is not one, not two, neither three but four gardens! 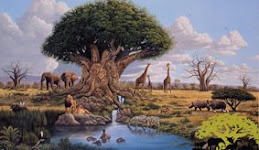 To distinguish them, four themes were chosen: the Earth, the Fire, the Air and the Water. This garden, planted a year before the site opening allows an excellent junction between the north of the site and the main activities in the Centre with the promenade and the Aqualagon waterpark. 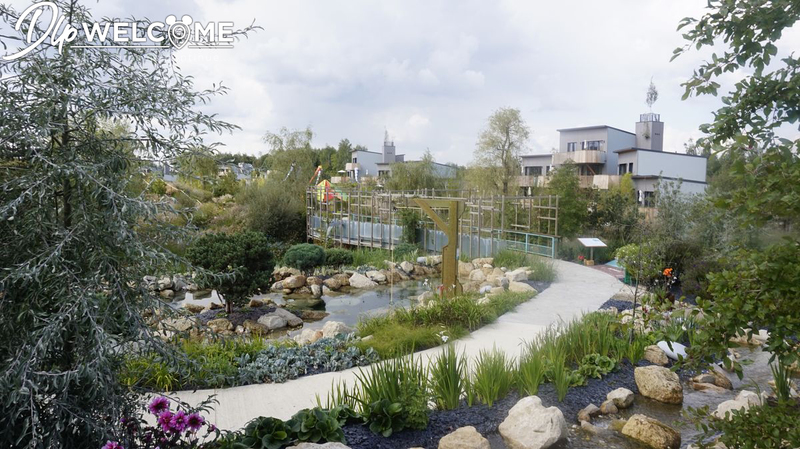 These "extraordinary gardens " well deserve their names, with playful and educational spaces, plants changing from an area to the other and an architectural contribution,. 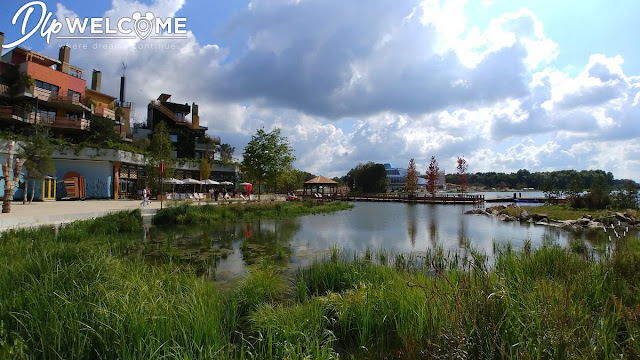 Here, everything is done to be out of the exterior world and the frenzy of the lake promenade and the Aqualagon waterpark. 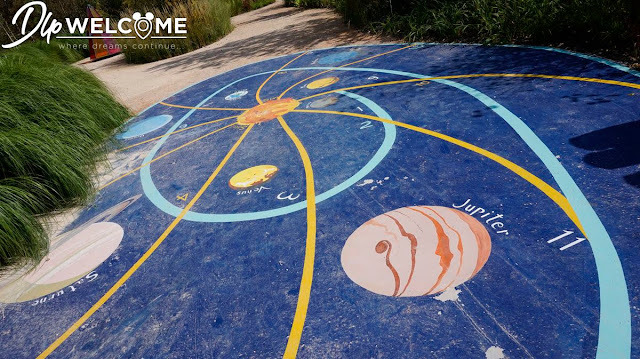 Our journey begins with the "Earth" garden. 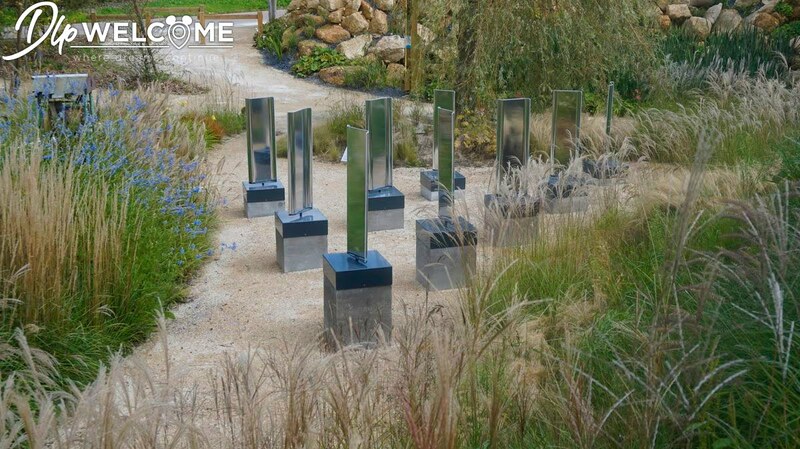 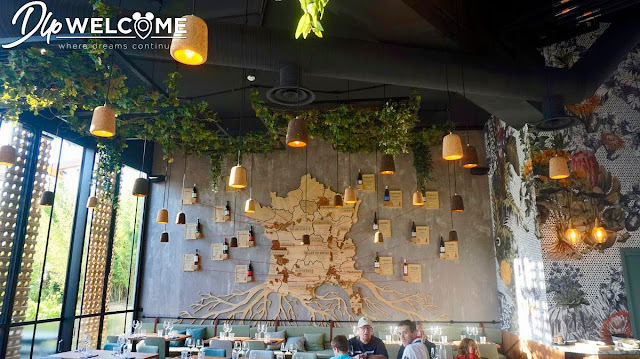 This one makes possible to visit a place where we can see vegetable gardens, flowers, and steel sculptures reminding the work of the earth and its blooms. 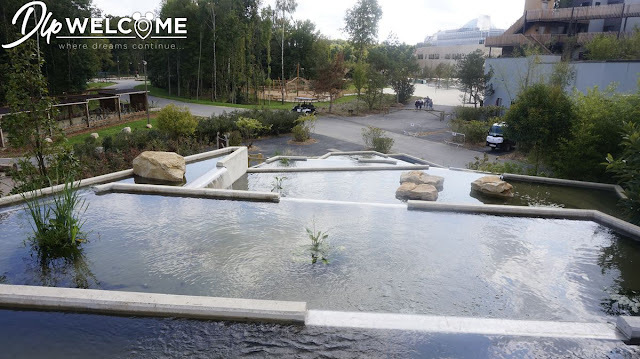 The heart of this place is the waterfall surrounded by stones. We arrive in a wooded area, the barks are present, red and black flowers, with grounds looking like volcanic rocks and pollinating insects buzzing all around. A campfire space allows to relax in the evening and a giant nest reduces us at the size of a chick. A walk on the heights allows to have a view on the whole garden and the next one. 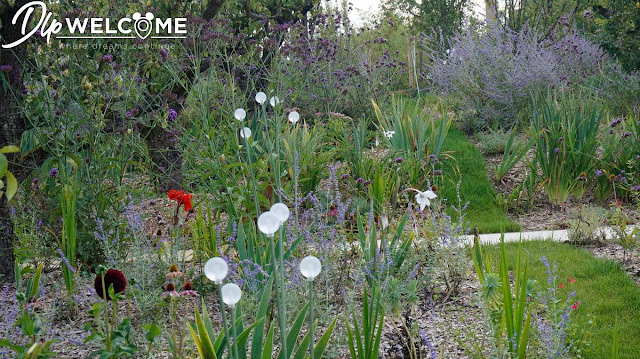 This garden dedicated to the air makes room for large vegetation undulating in the wind, flags and other chimes bring tones and touches of colors to the area. 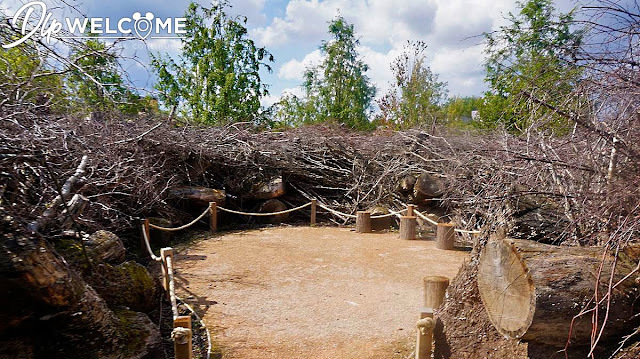 This open space is facing the sun which allows, thanks to the wind, to sweeten the sun rays while inviting to continue the visit to the last garden. 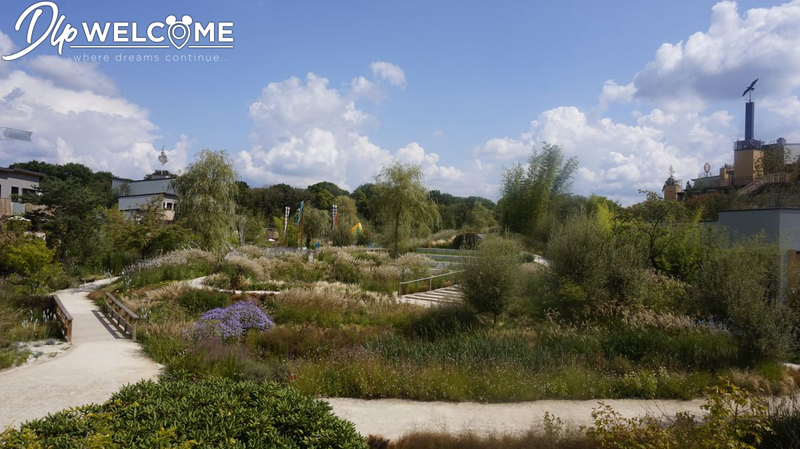 The highlight of the visit of the gardens as it ends on one of the spaces where the landscaping is making the visit refreshing. 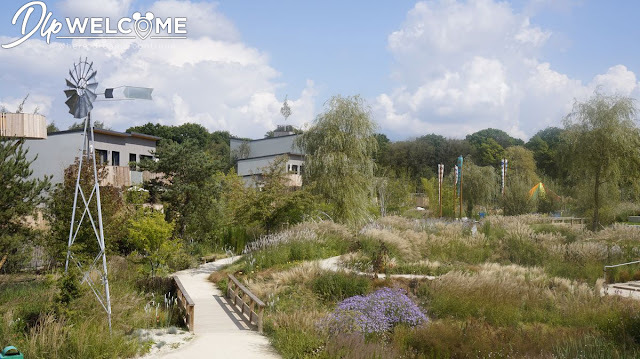 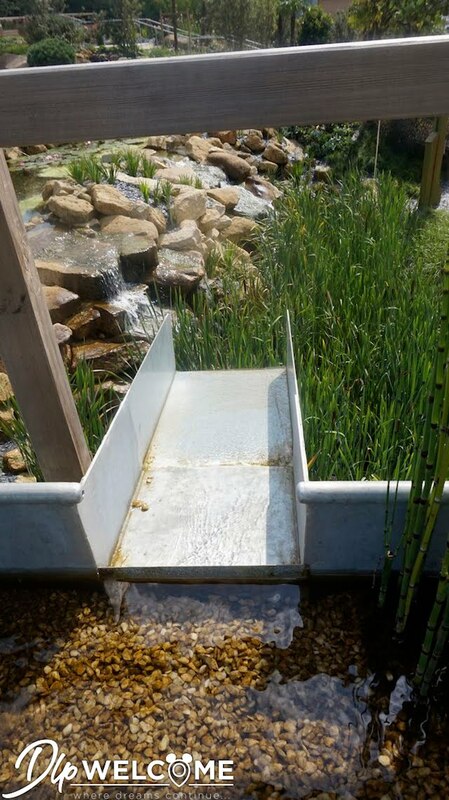 The colors of the place, the water flowing from all sides, the vegetation using again partly the plants found in the previous gardens, allows visitors to move in the paths to the summit, offering a view of the Aqualagon. 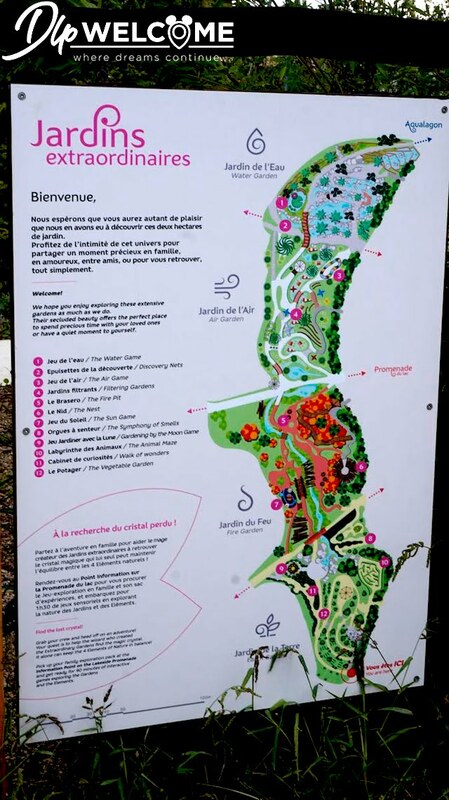 The "Extraordinary Gardens" are, as you'll have understood, a unique place where architecture, landscaping and tell chosen plantations offer a place of wonder whose exploration and contemplation I can be done on several hours from day and night. 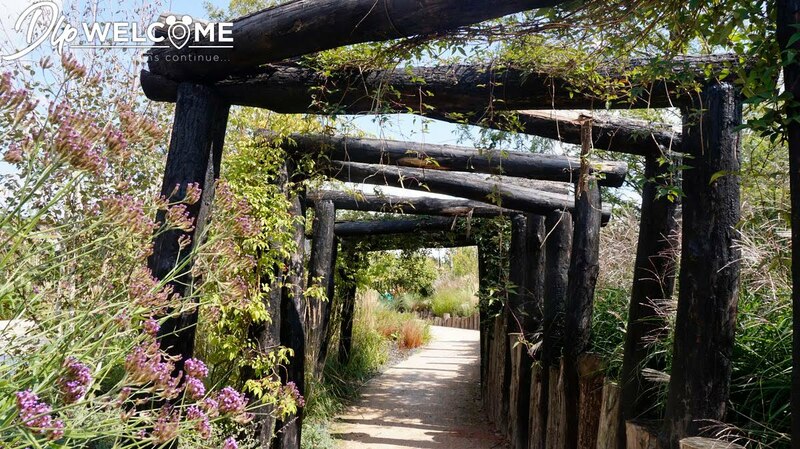 These gardens, spread over nearly five acres and are a real surprise which brings man closer to Nature, awakens the senses and shows the biodiversity of the land. On the way out of the Extraordinary Gardens, the Aqualagon waterpark is calling us. 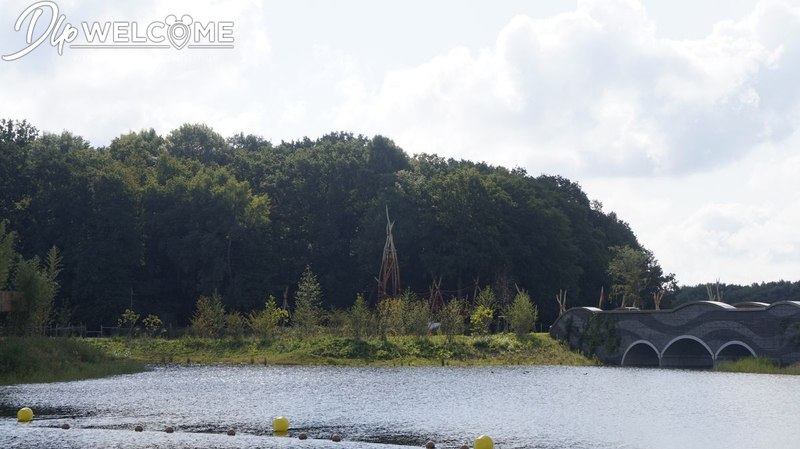 This structure can be seen from all over the site, both from the visitors entrance or others buildings even if it's at more than one kilometer. This structure, created by architect Jacques Ferrier, allows to be both an icon but also to be hide in the environment with the reflections of its façade. 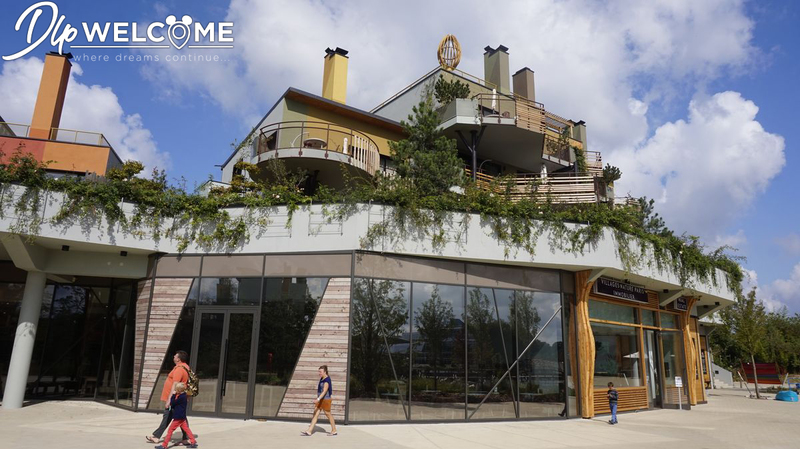 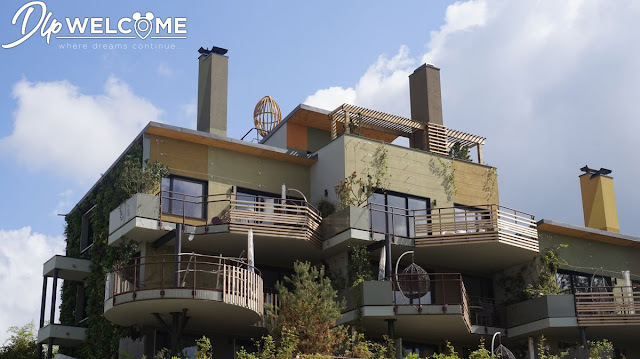 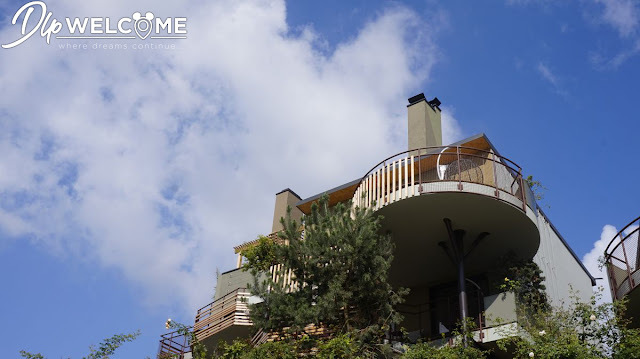 The structure was designed as a suspended garden which rises from the shores of the lake to more than 20 meters high, up to a panoramic viewpoint at 360 ° on the entire site. 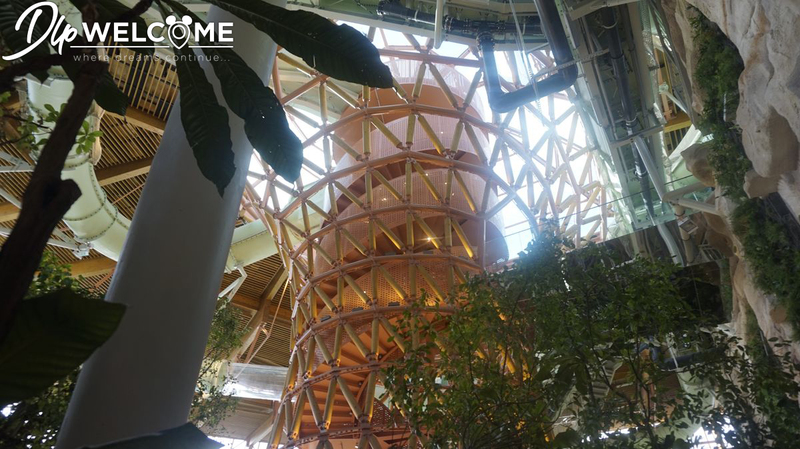 Designed as an unfolded origami, the structure is made out of 800 m3 of woods from eco-certified forest with a highest point at 27 meters. 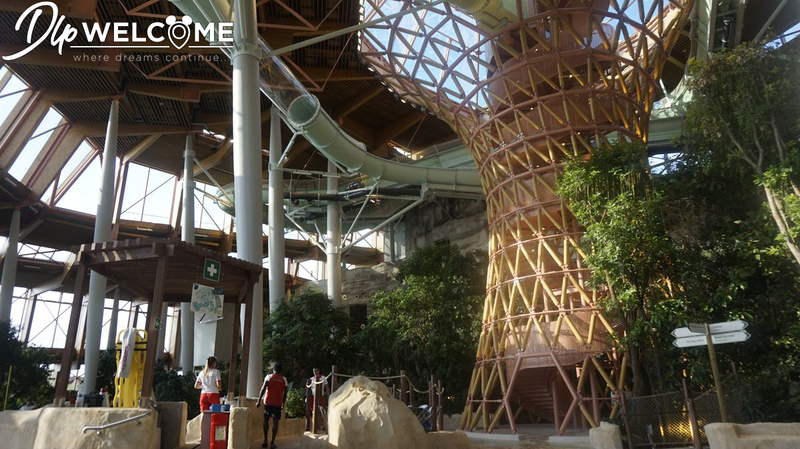 The structure of the Aqualagon is wonderland the surprise as it's all covered in wood while the humidity is specially high with a water at 30° C all year round. 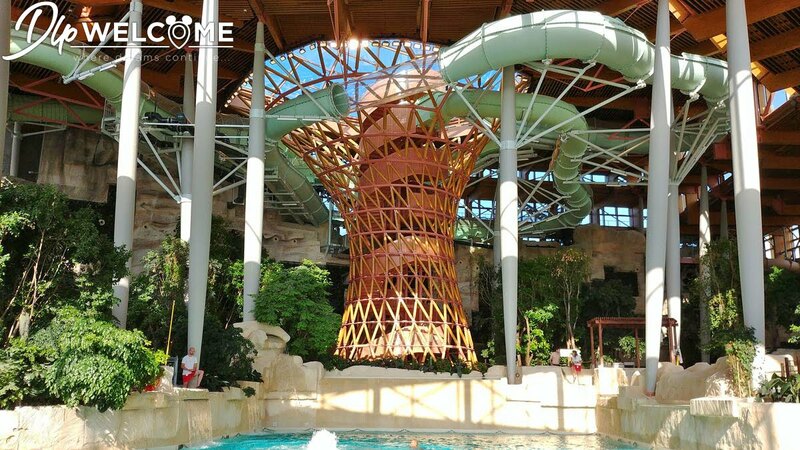 In addition, two water slides are suspended from this structure overlooking at 12 to 18 m of height the wave pool and the children’s playground. This leisure area is THE location of the destination. And if the wave pool and the seven indoor water slides, including the awesome "Crater" raft slide do not tempt you, almost 2500sqm of outdoor lagoons await you with an overflowing pool facing the lake. 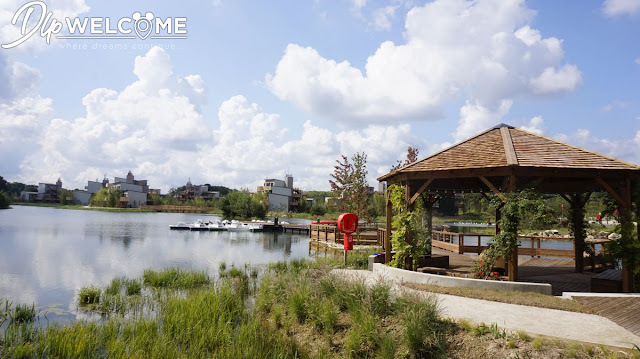 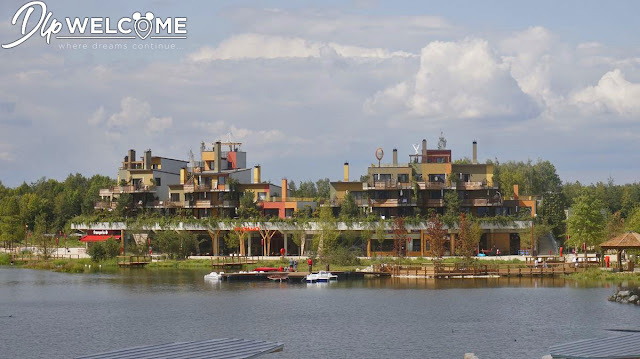 Lake Promenade: This place for encounters, shops and restaurants is near the 40 acres lake. 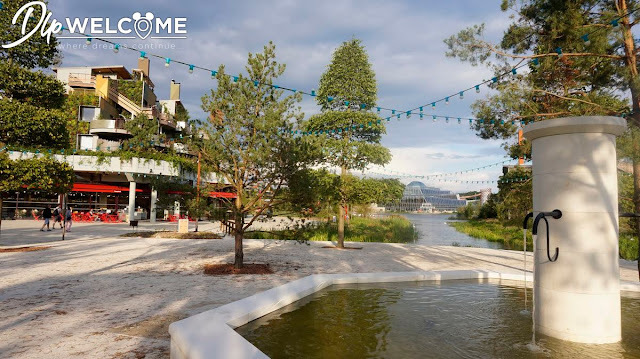 With a plant city over it, it's the perfect place for nighttime activities such as the "Soirée Guinguette", musical concert among others. 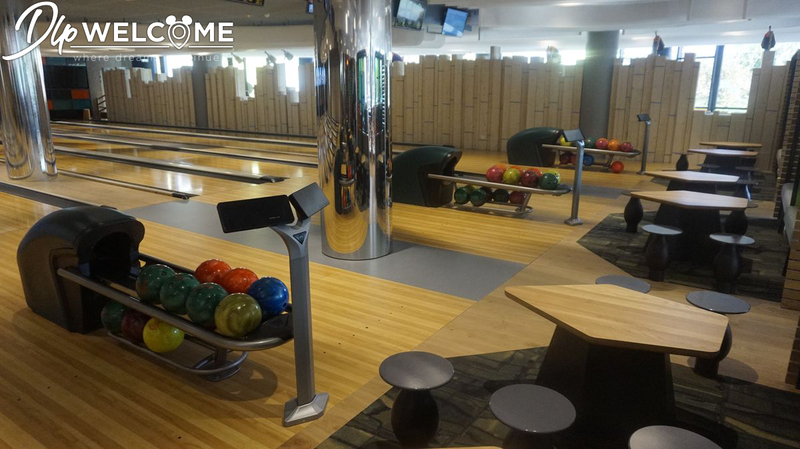 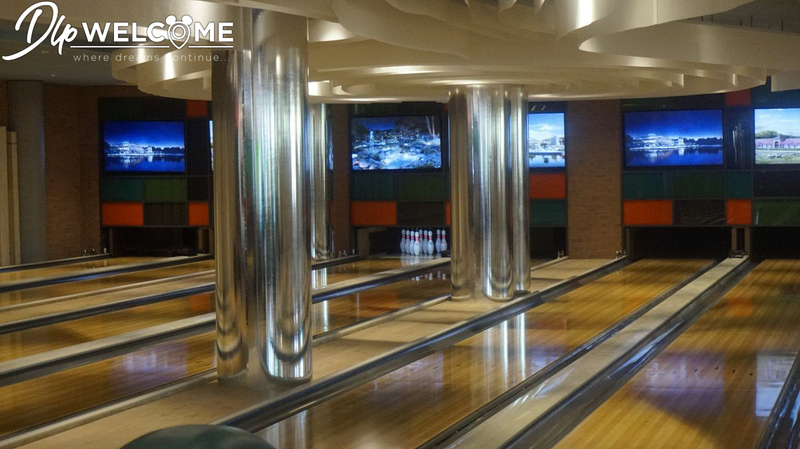 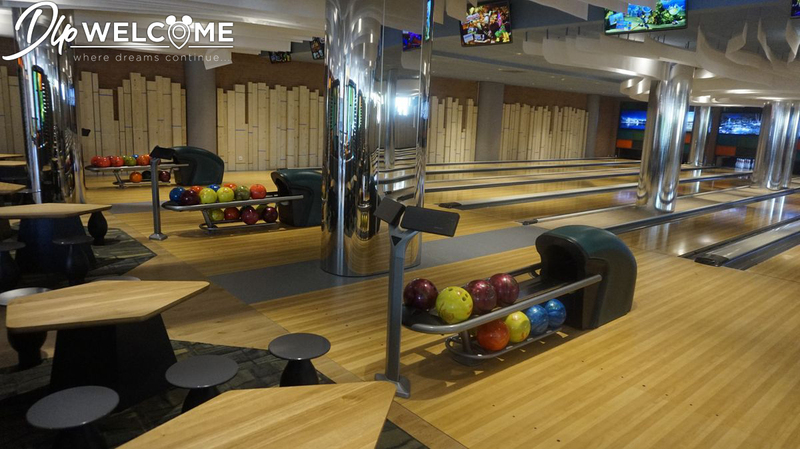 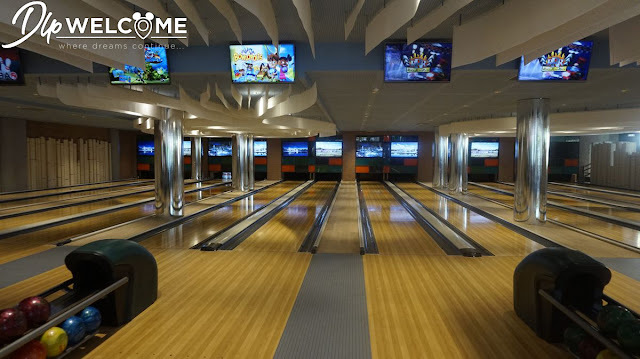 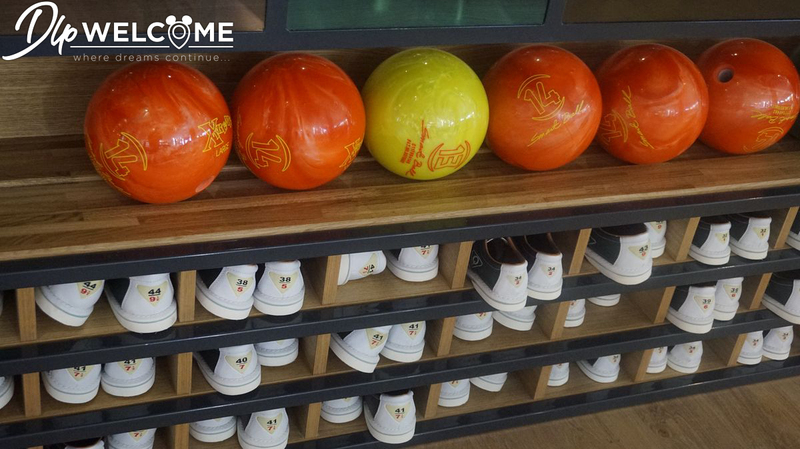 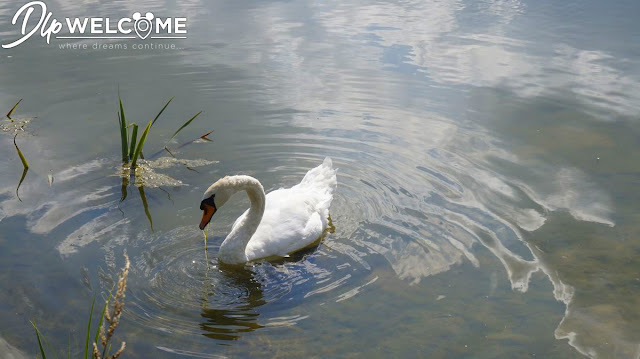 There is also a bowling alley, a children’s club, as well as activities such as pedal boats to see the biodiversity of the swans and ducks living on the lake. Finally, whatever your place of accommodation will be, three electric bus lines will help you to move around the site. 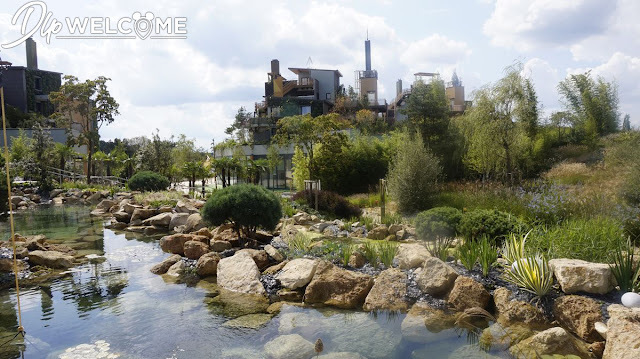 The environmental commitment to avoid any impact and CO ² emission is well thought. 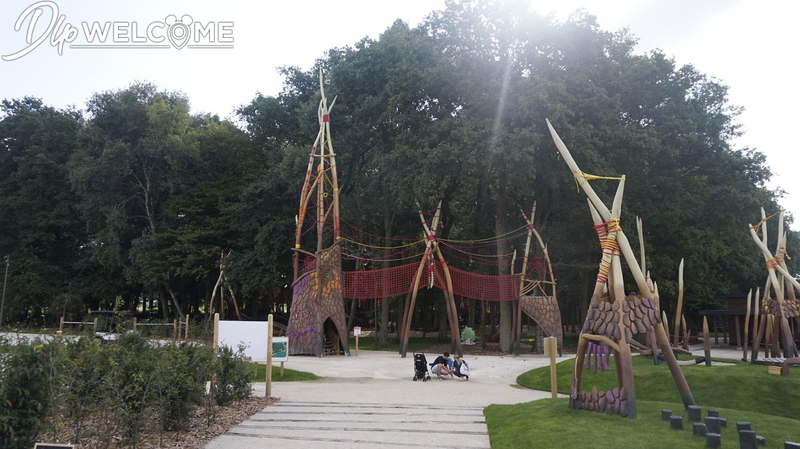 Finally, Max Feeling about Villages Nature: The site is not yet fully open to the public. 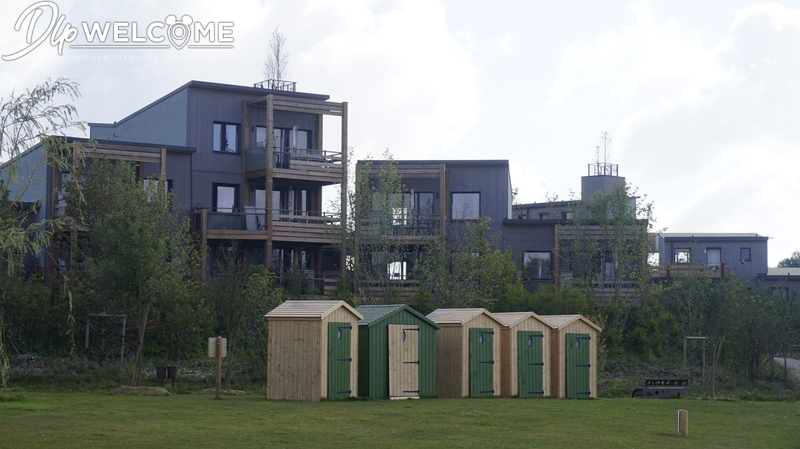 Not all cottages and apartments are finished. That said, the activities and structures offered to visitors are all operational. 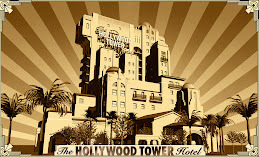 So we find ourselves in a scenario where all the facilities are oversized for the current number of guests. 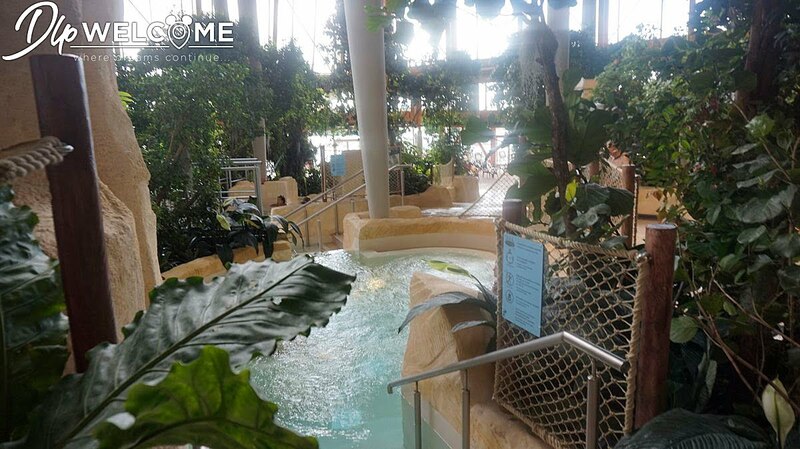 It’s a little paradise for visitors! 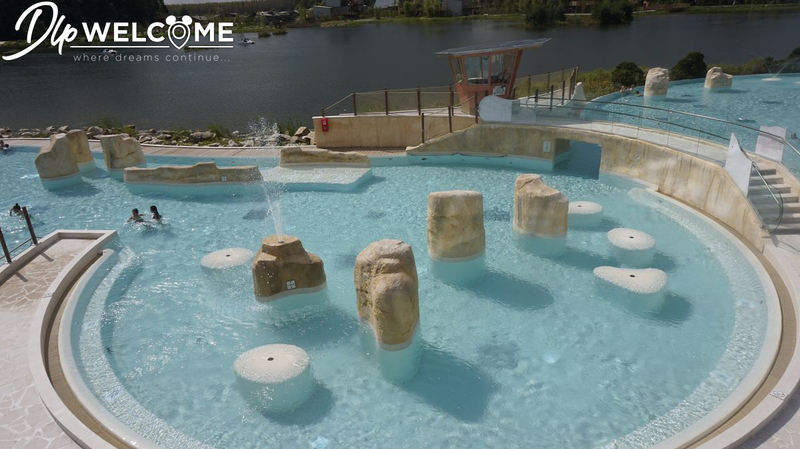 So, make sure to take advantage of brand new, clean, places in a virtually private setting while waiting for the opening of all accommodations. 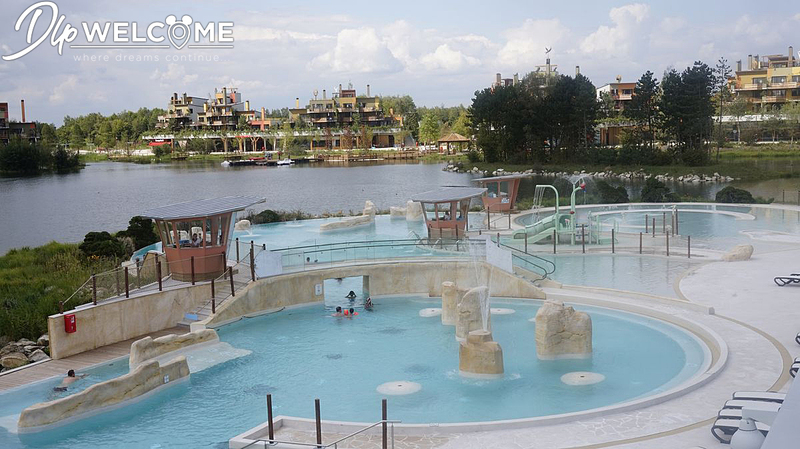 Only two water slides (Aqua coaster) are still closed in the Aqualagon, but should open for the Halloween holidays, at the end of October. 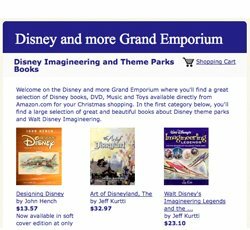 This problem is not really one considering the on-site quality service. 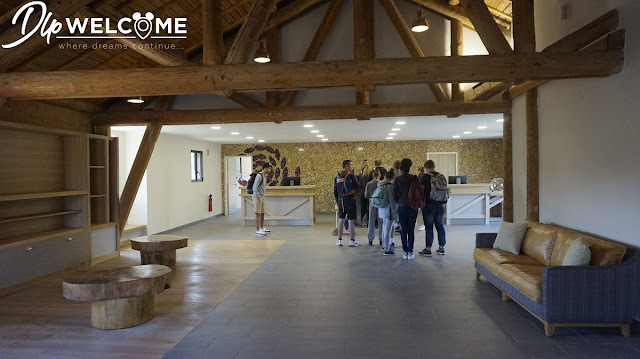 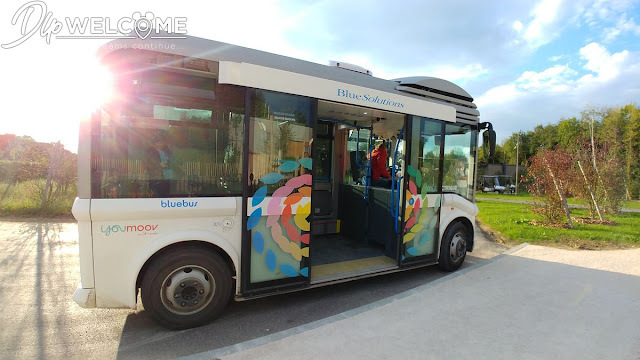 Moreover, if you do not live on the site, day visits are possible at the price of 50€ per adult and 40€ per child during weekends and holidays ( and10€ less for each during weekdays ). 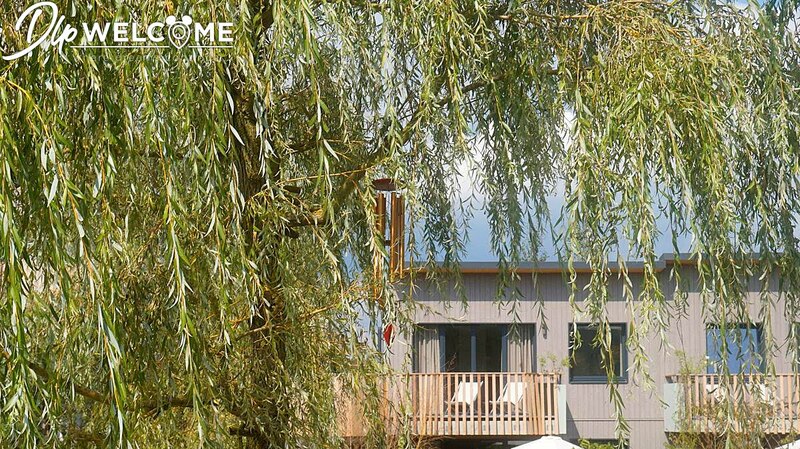 Considering the offers, this level of price seems reasonable to me if one considers that a family stay with accommodation is the main target. 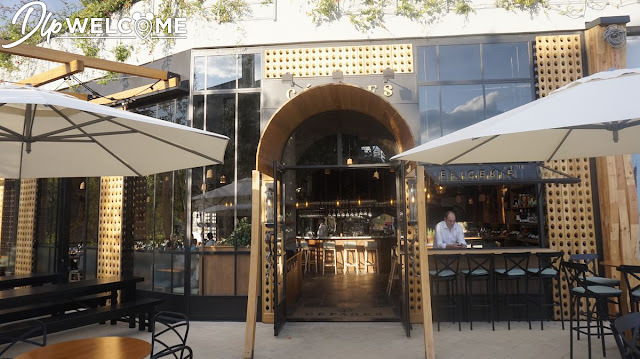 At the end, apart a few finishes which still have to be done here or there, the Parisian region is fortunate to have such a site close to Paris with such a leisure offer. 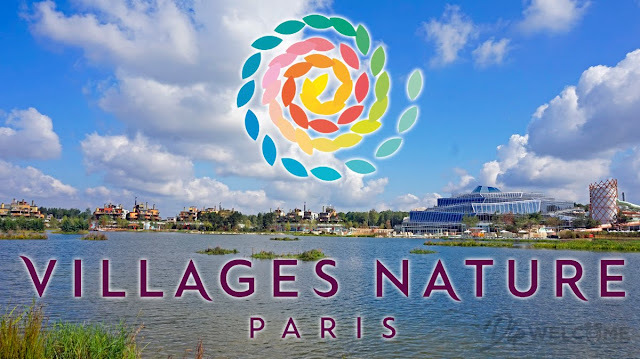 It is just a pity that there are not yet shops selling Villages Nature merchandise. 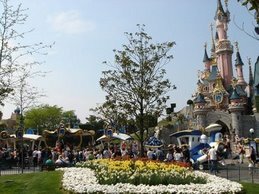 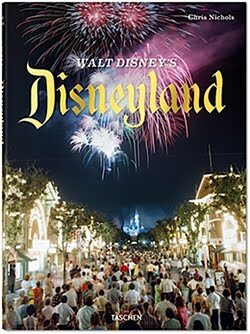 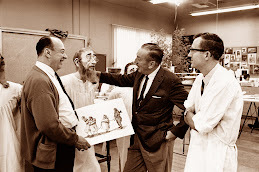 To spent a week in the Villages Nature with one or two days of visits to the Disney parks and come back in the evening in his cottage can be a great family vacation for those who love the most famous mouse in the world. 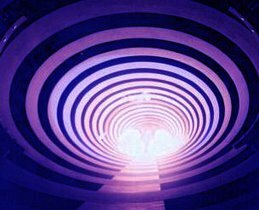 I don't really understand the place. Seems like a family resort? 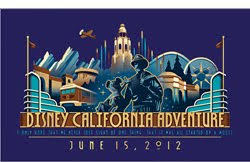 Who is going to go? 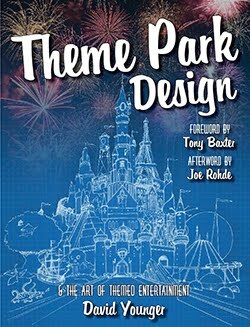 The design looks quite corporate. 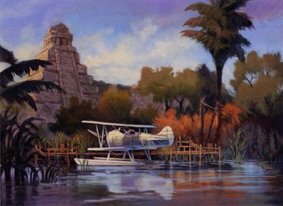 A little Disney History info : the "welcome house" shown here is actually the former reception building of the Davy Crocket Ranch. 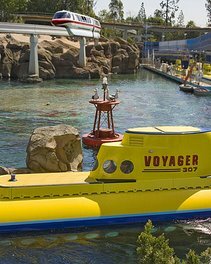 BTW it's the day guest entrance only. 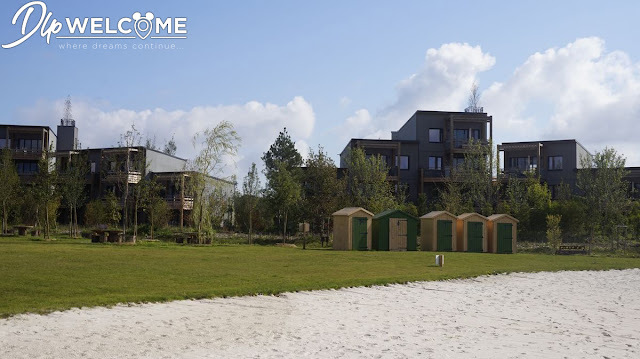 A grander entrance (car only) for overnight guests is located opposite the complex. 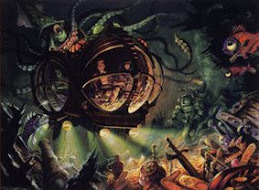 VN still run after its completion. Many cottages aren't ready. 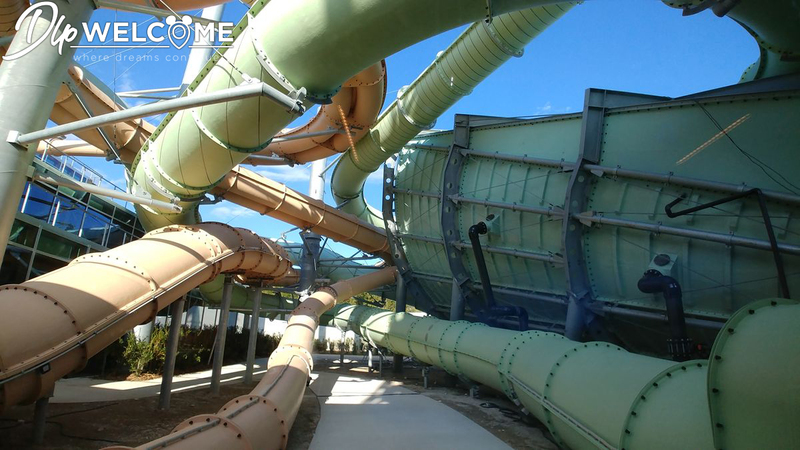 And the 2 most sophisticated slides won't open before late september and late december. Not to mention that several DCR bungalows have now a direct view on the fence & parking lot of VN !!! 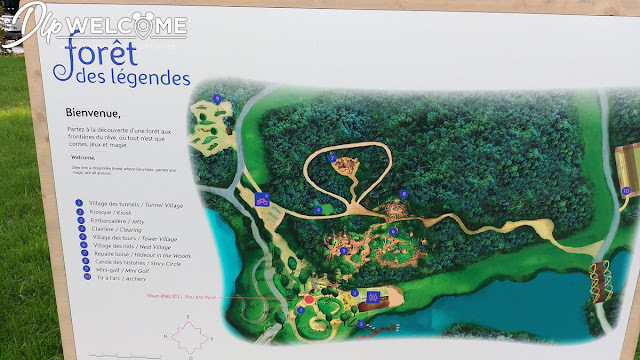 Is there bus transportation available to Villages Nature from Disneyland Paris? 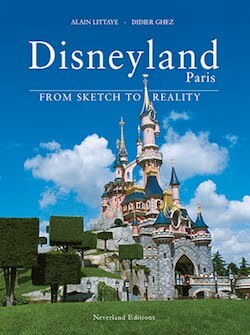 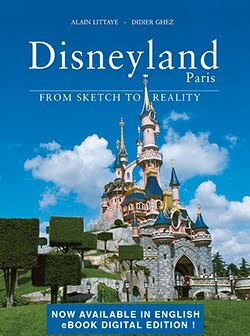 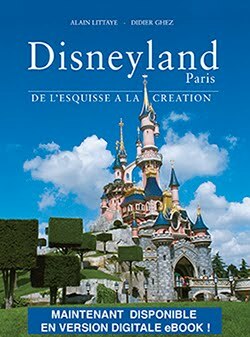 Would like to visit for the day while we are staying at DLP.